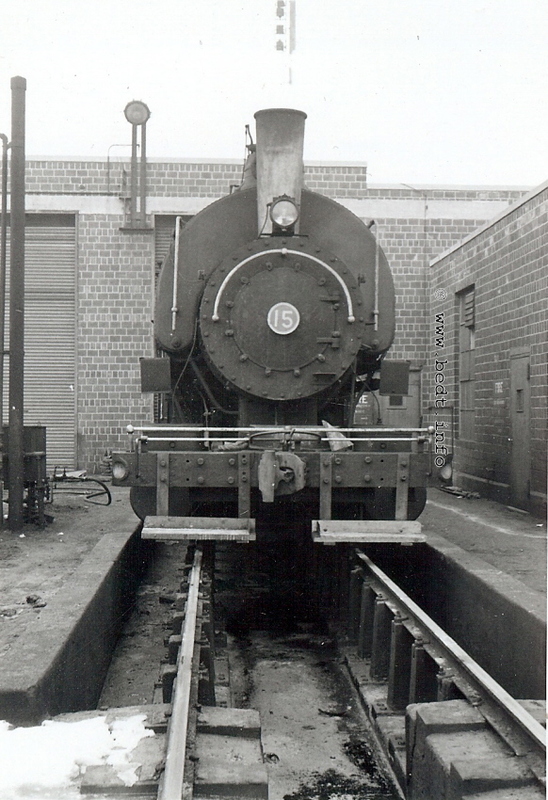 Wheelbase: 11' 0" Tube Diameter: 2"
converted to coal firing and side tank, and cosmetically altered to resemble Thomas the Tank Engine. 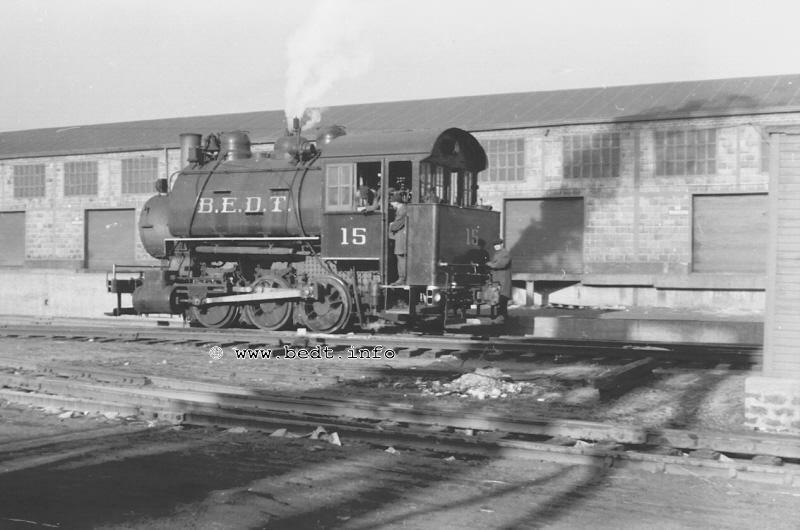 Rounded bottom of saddletank repaired / modified with square "skirt"
BEDT documents dated June 24, 1963 request $5,000 asking price of #15. 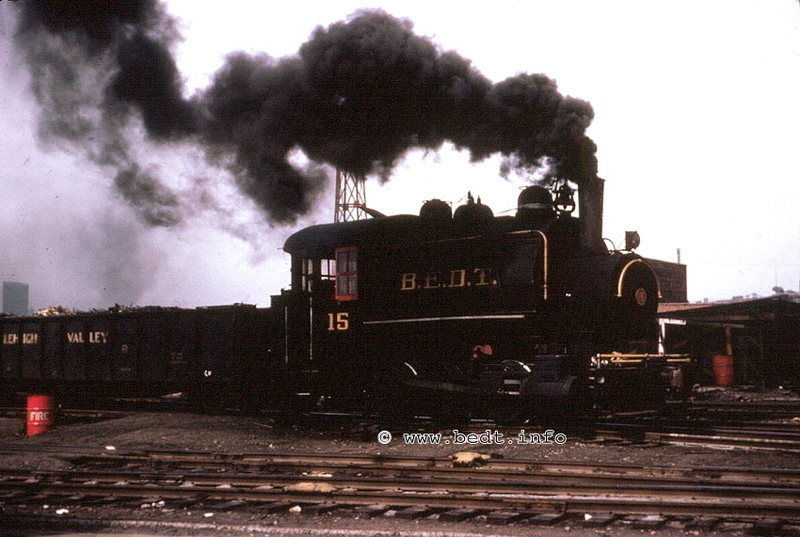 Non-BEDT documents (5/90 issue of Semaphore) shows #15 was sold to G. Hart as well. 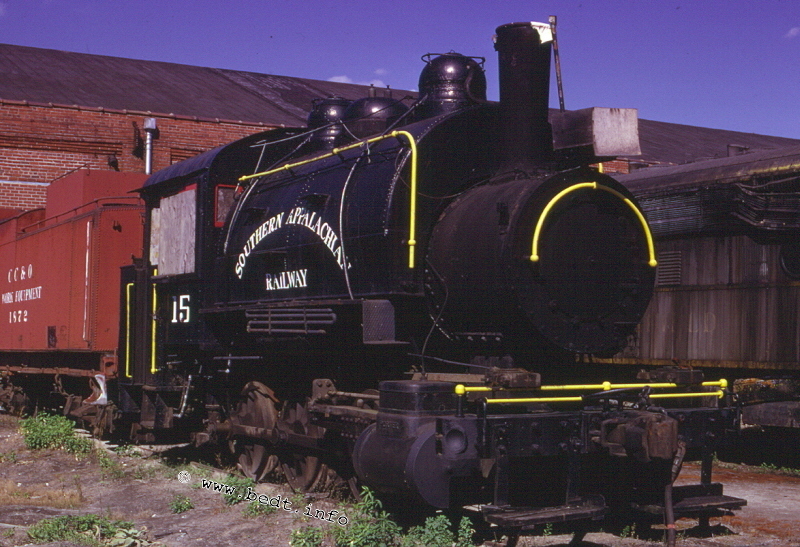 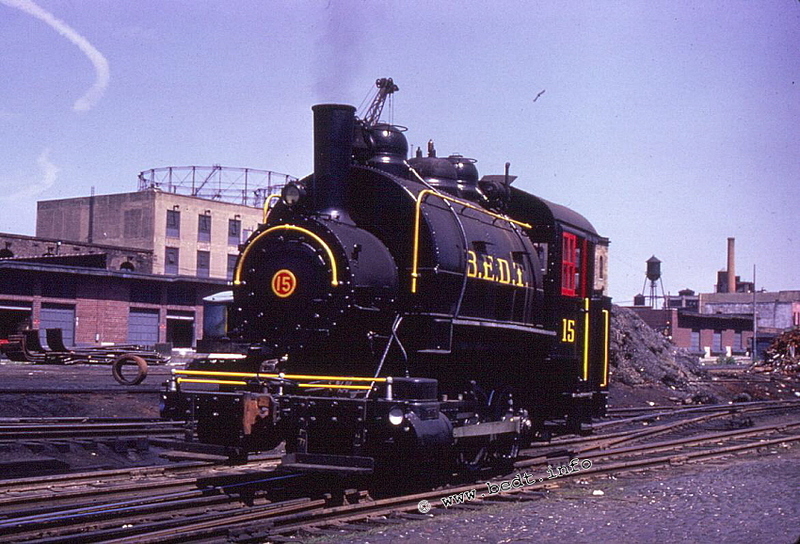 This is incorrect, as this engine was sold to Edward Bernard for use on South Appalachian Rwy. 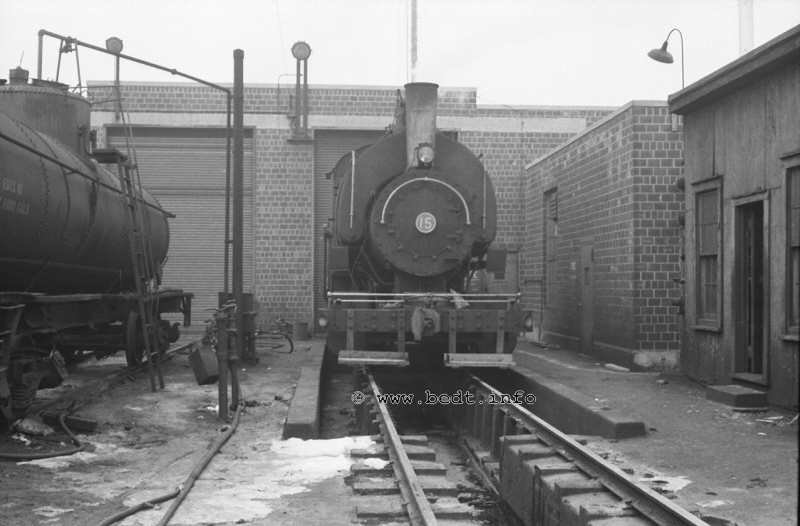 to the left side of smokebox. 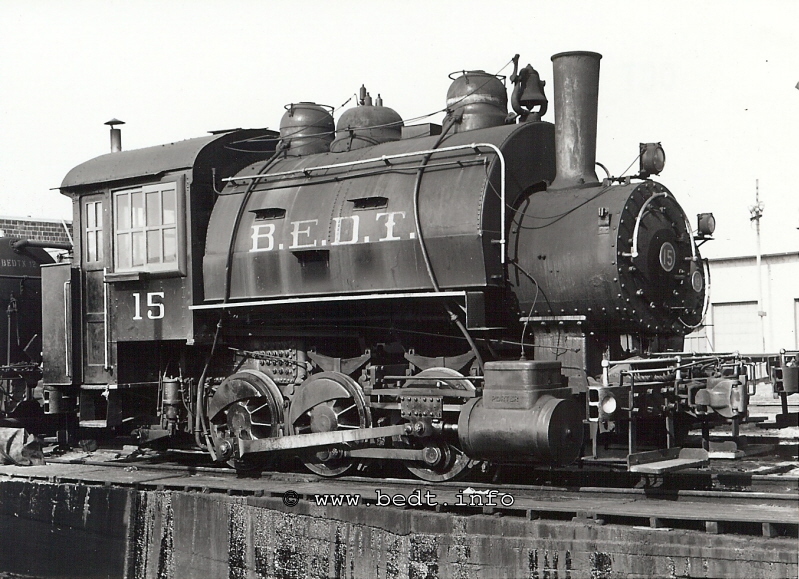 Sold 1975 to Toledo, Lake Erie & Western, in Ohio. 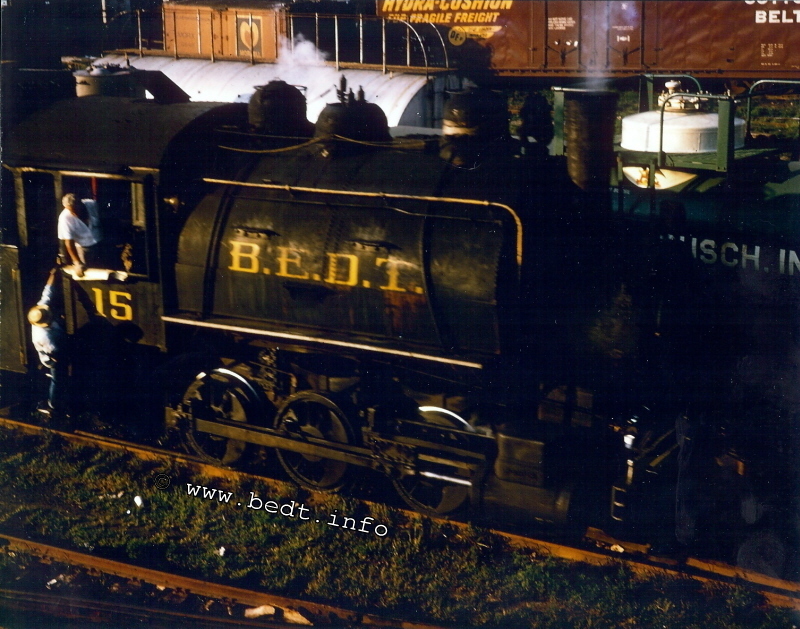 Arrived SRC 5/9/98. 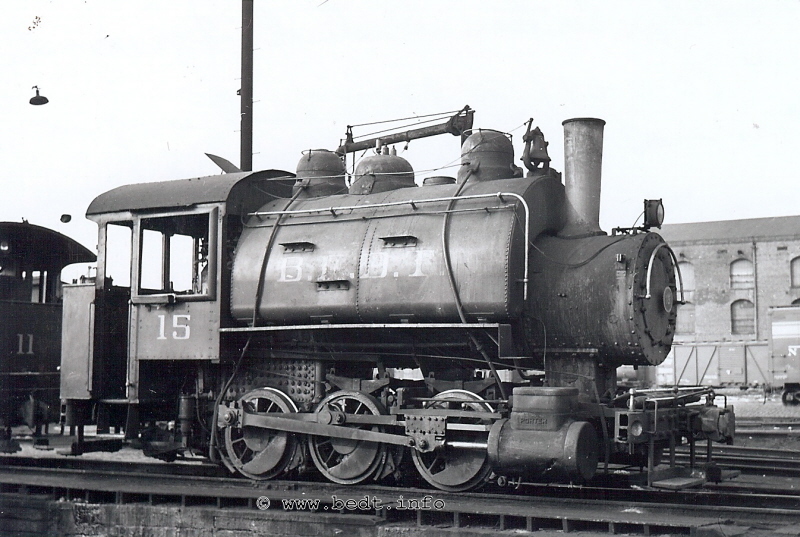 Was oil-fired, converted to coal; renumbered as Thomas #1. 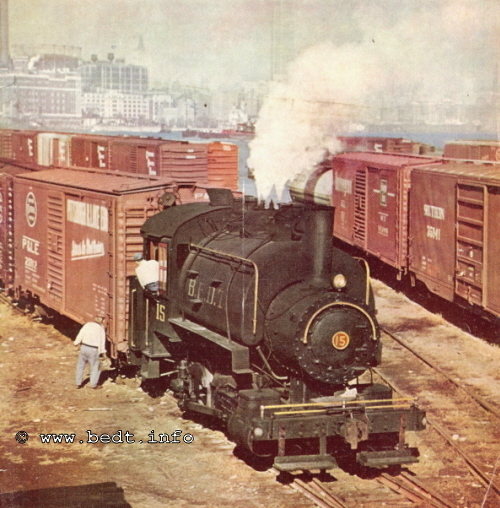 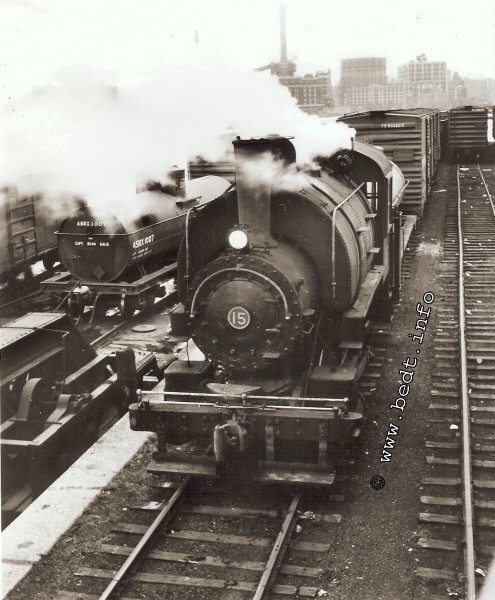 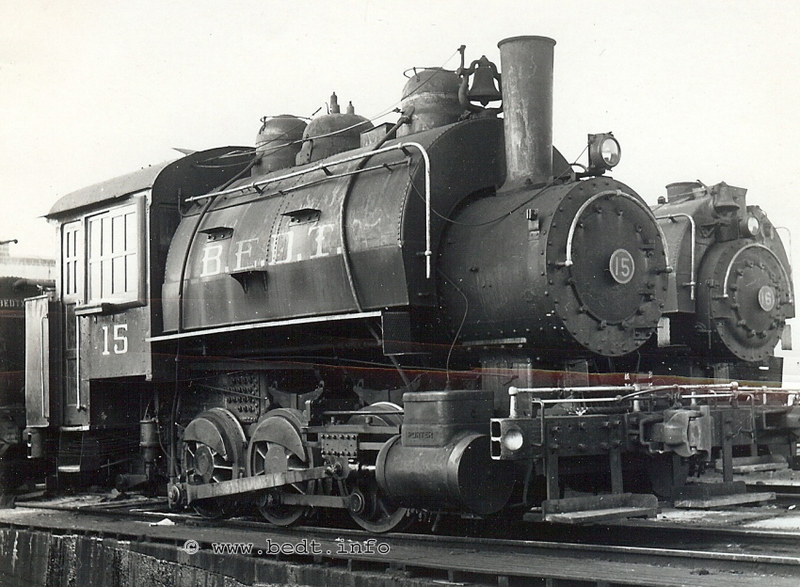 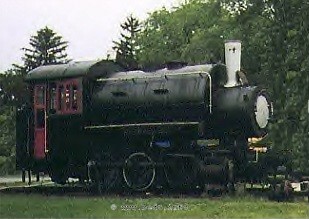 Locomotive was modified extensively to resemble Thomas the Tank Engine. 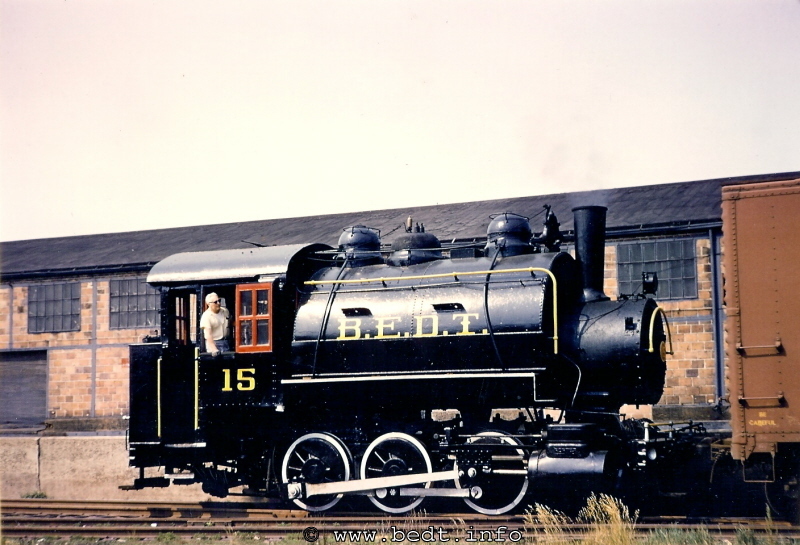 Locomotive first test-fired on 4/14/1999; Test run 4/29/1999. 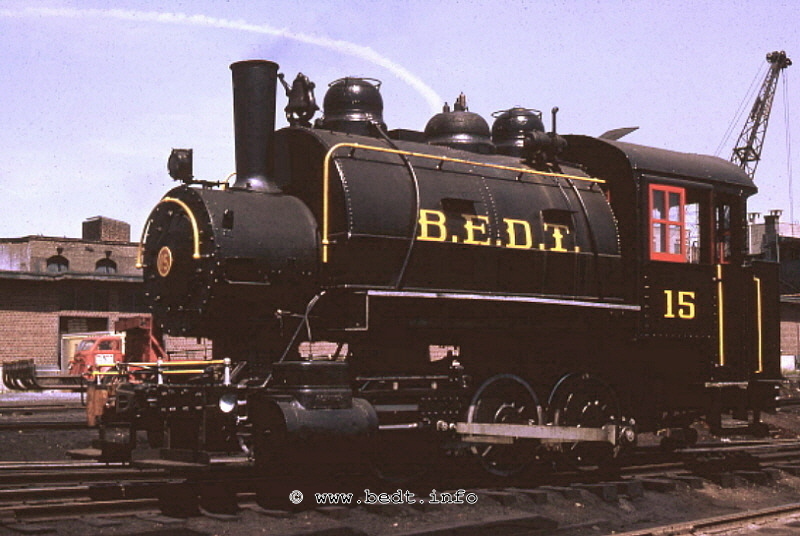 In service. 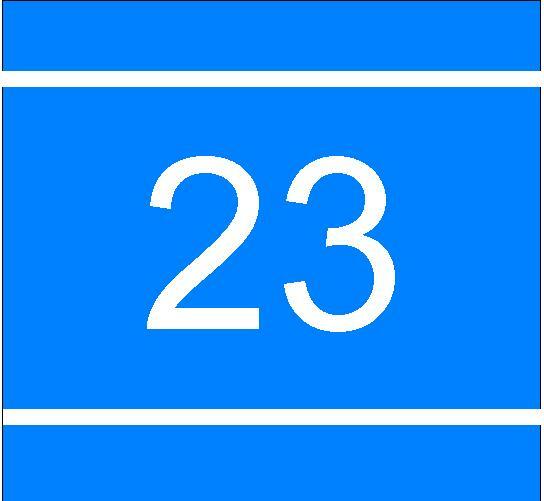 one piece pilot foot board, and solid front pilot with bolt on poling pockets. 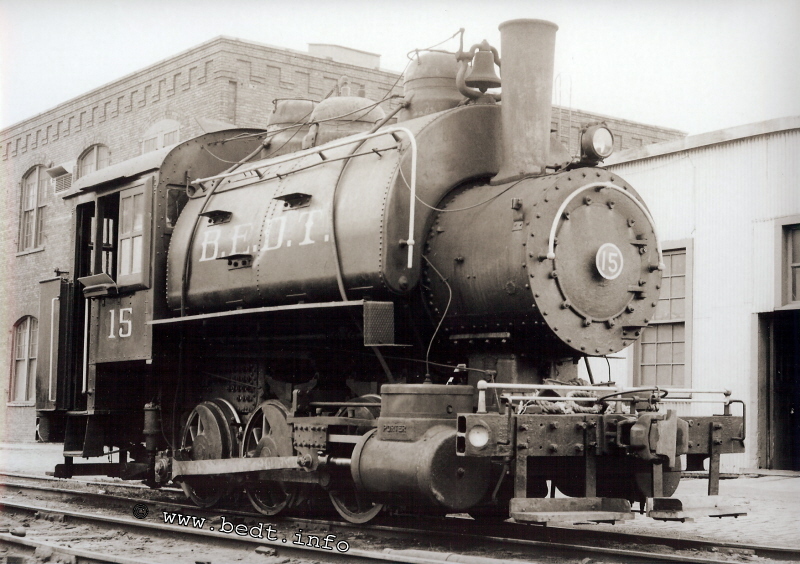 solid front pilot with bolt on poling pockets. 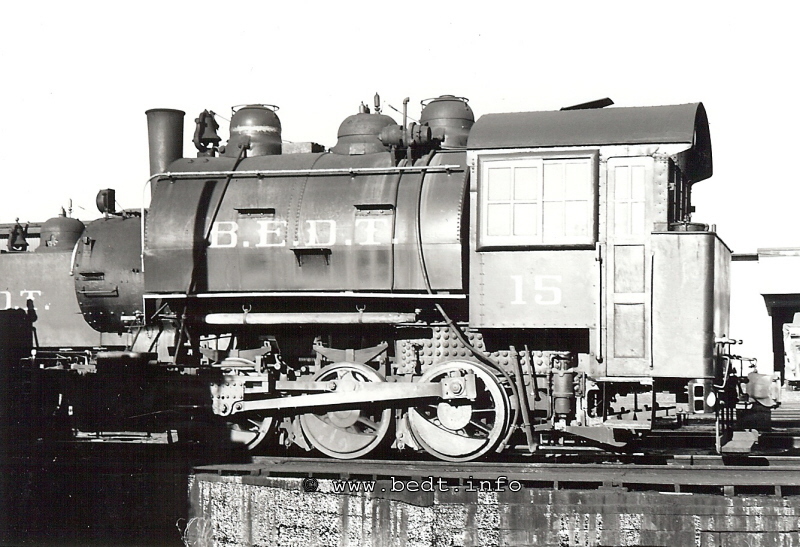 solid front and rear pilot with bolt on poling pockets. 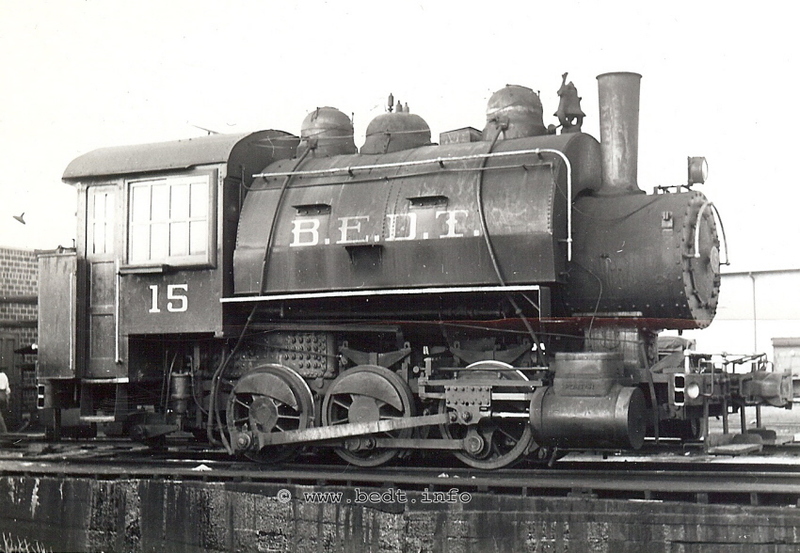 Note old style herald, and Baldwin style headlight w/ numberboards. 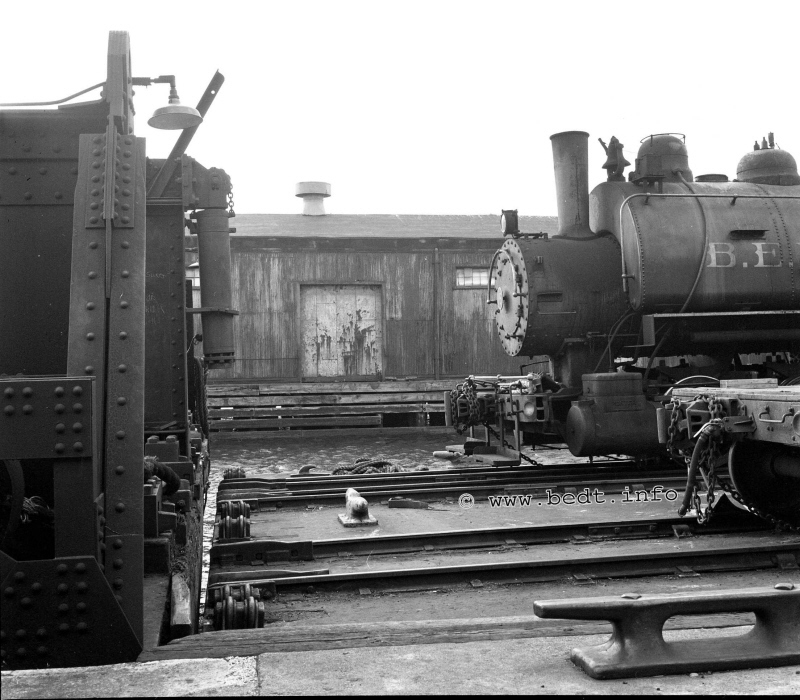 Front & rear pilot beams now hollow cast steel. 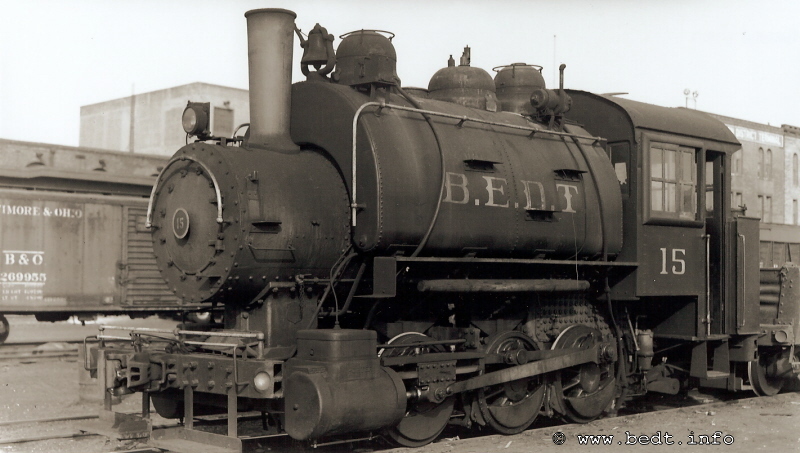 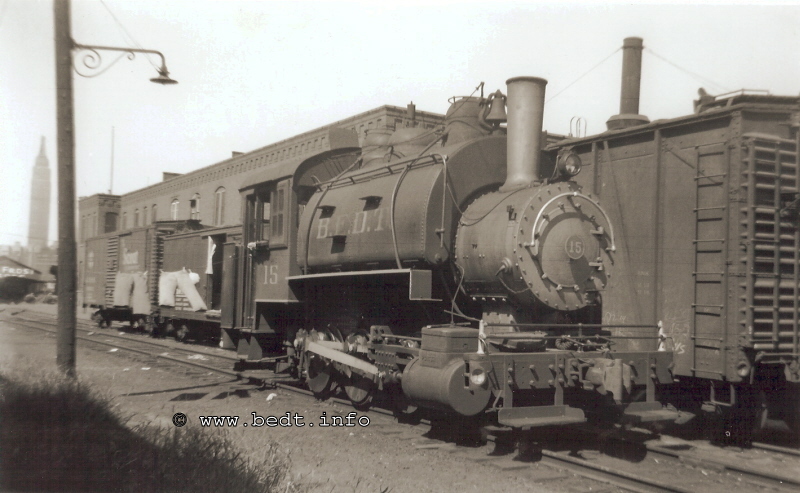 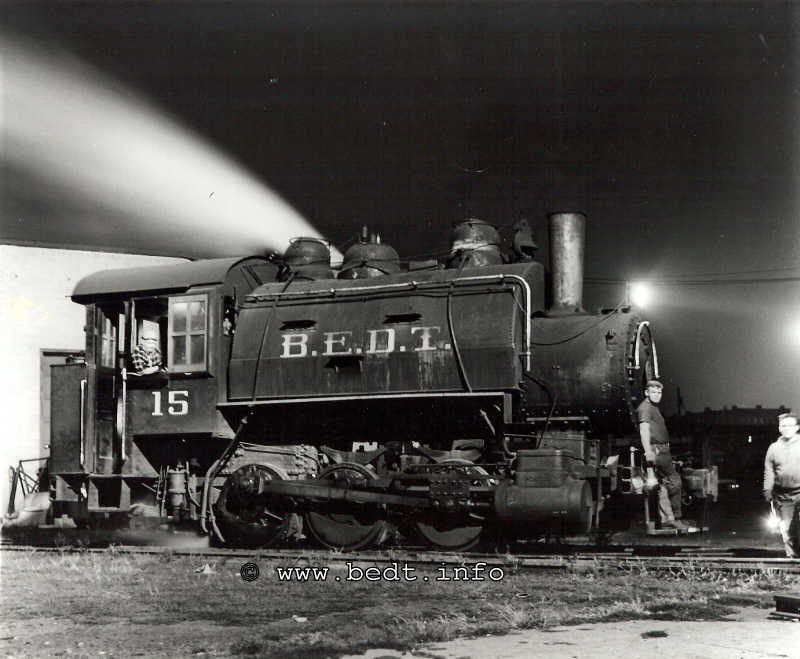 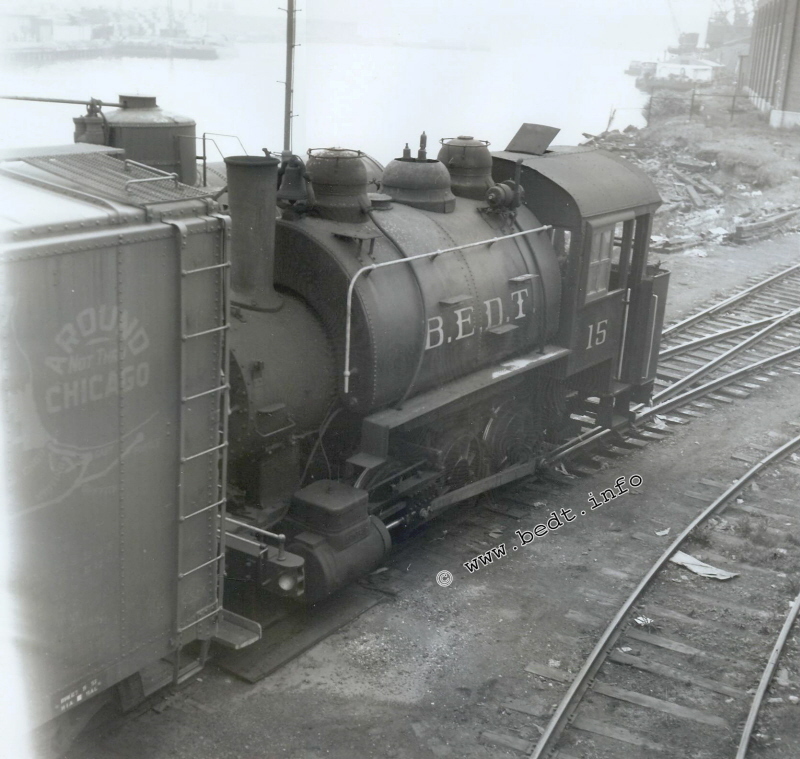 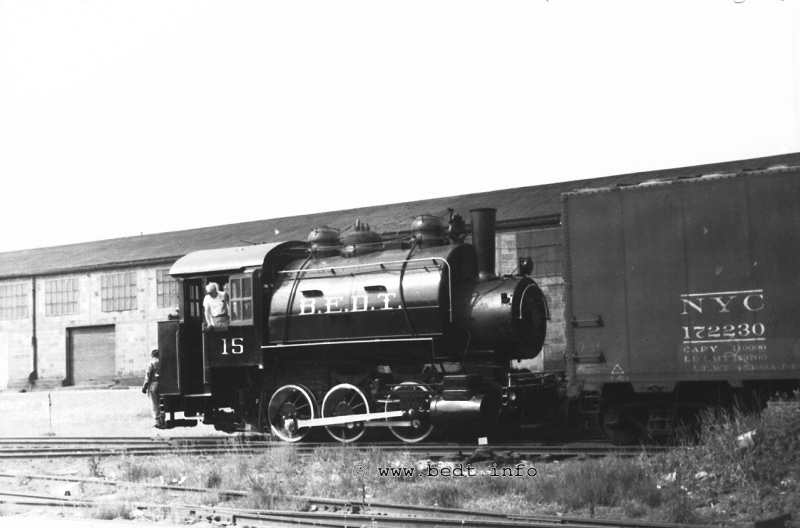 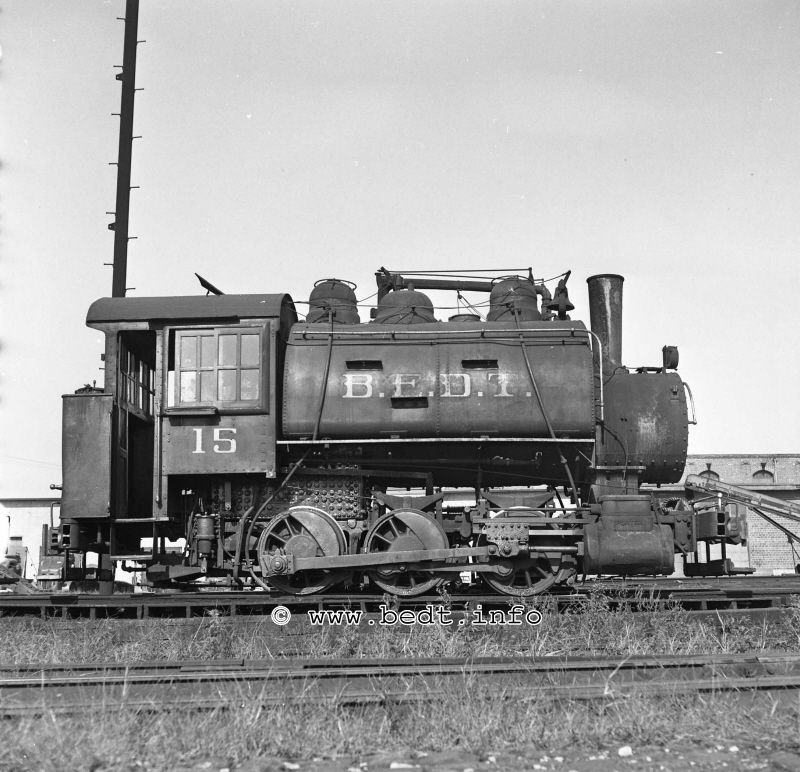 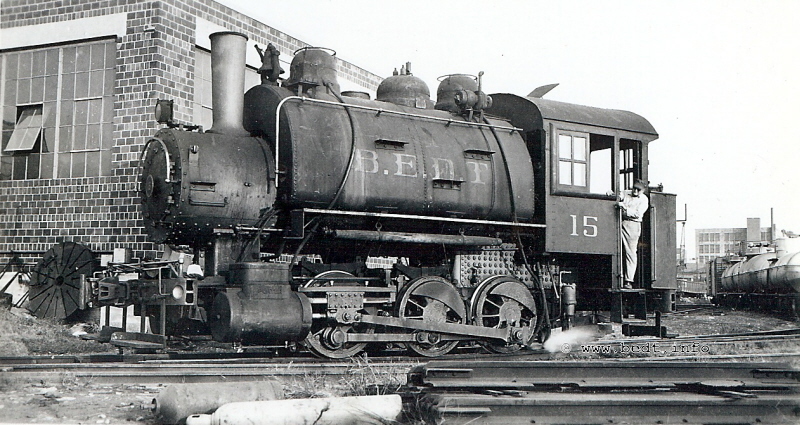 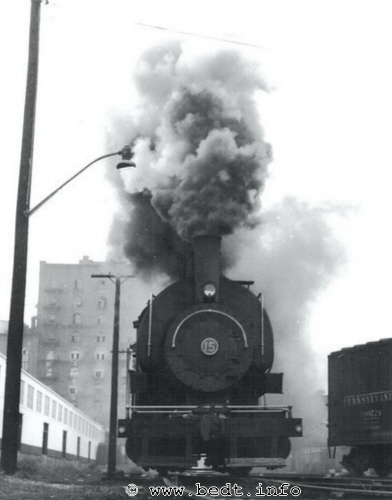 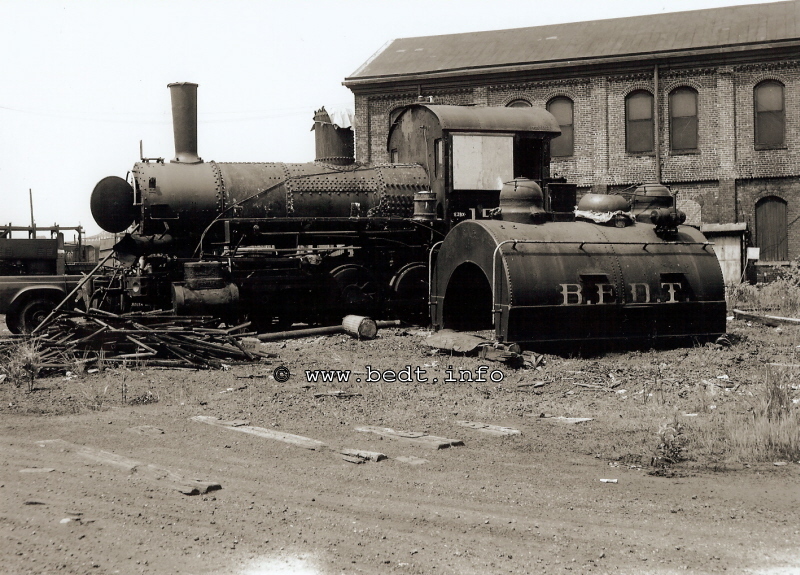 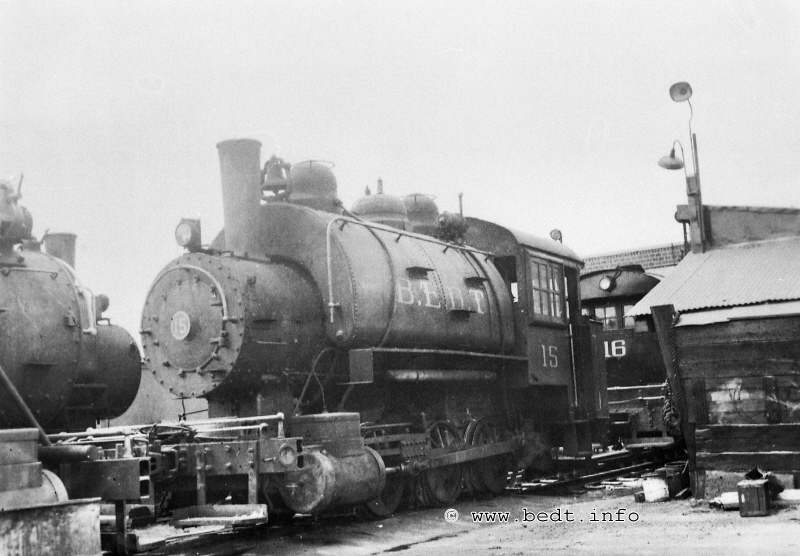 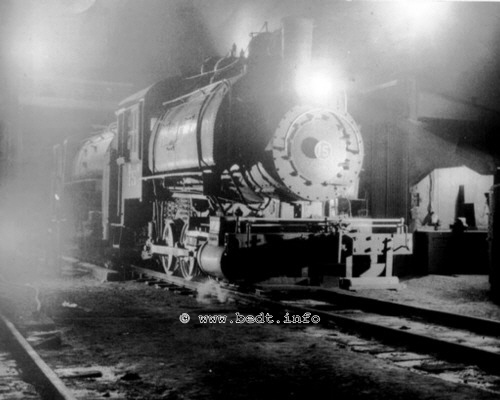 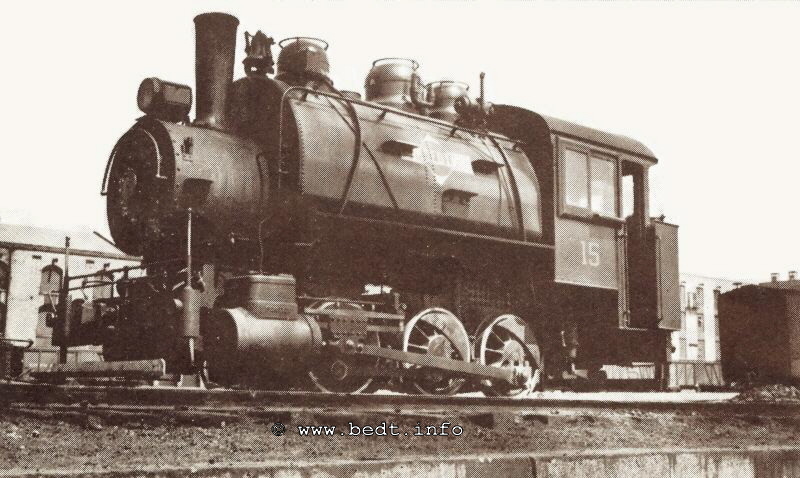 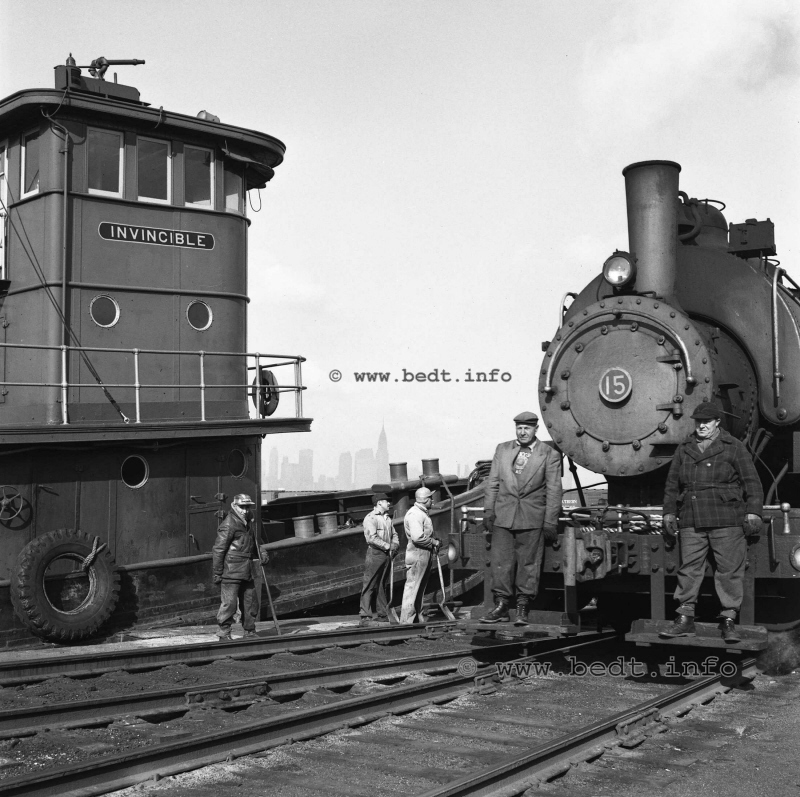 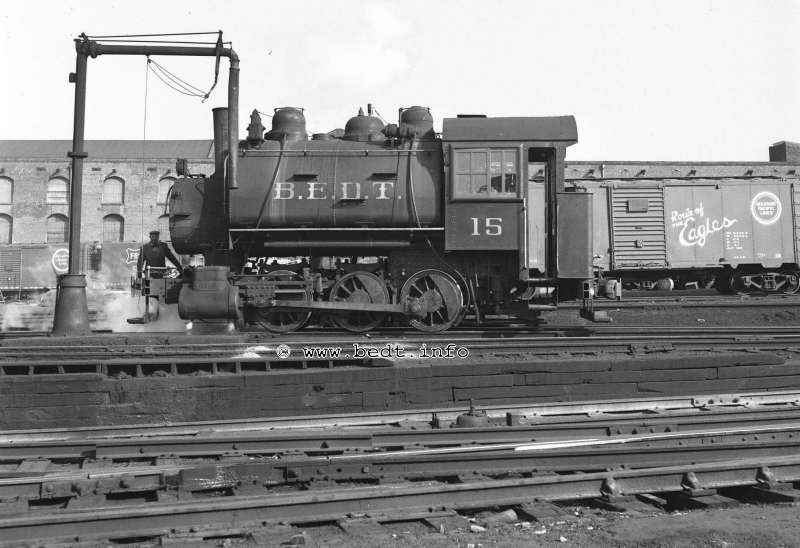 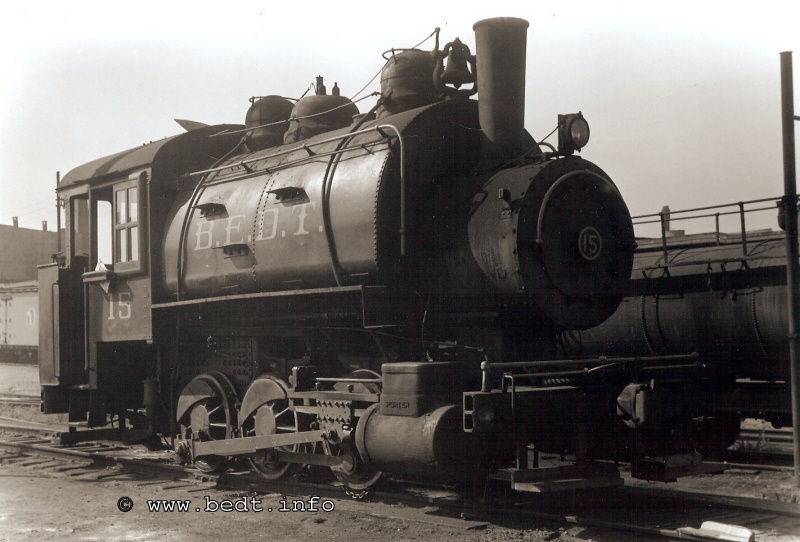 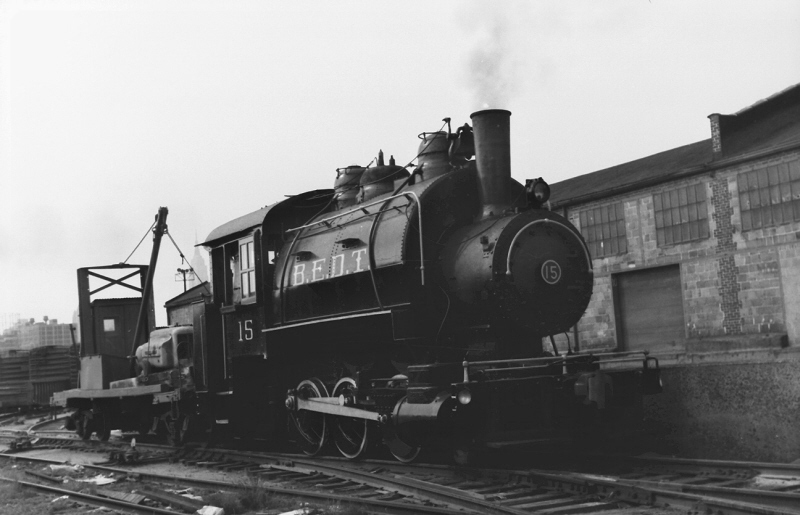 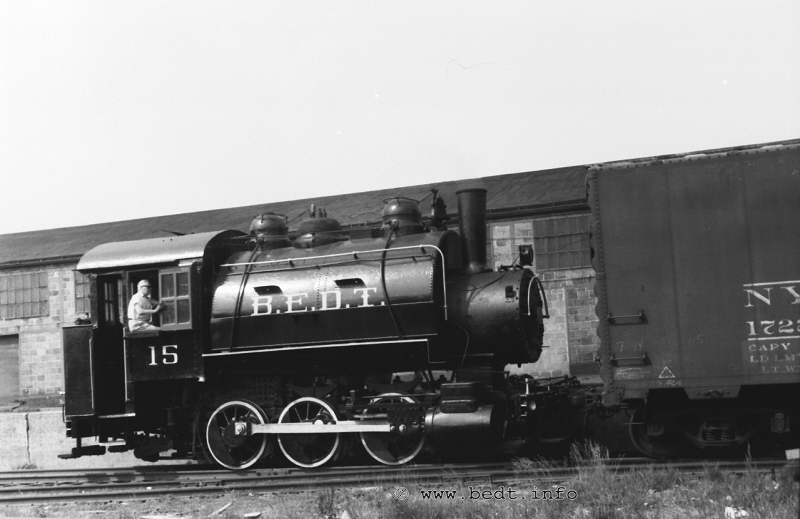 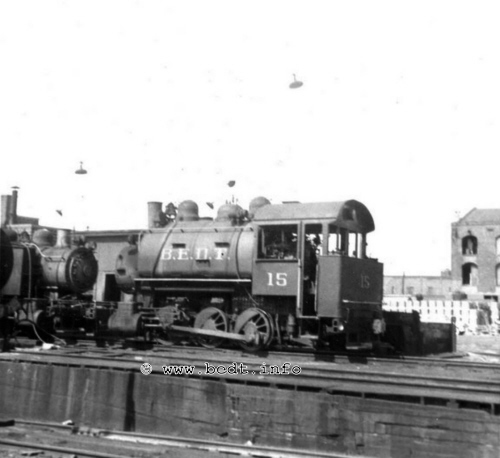 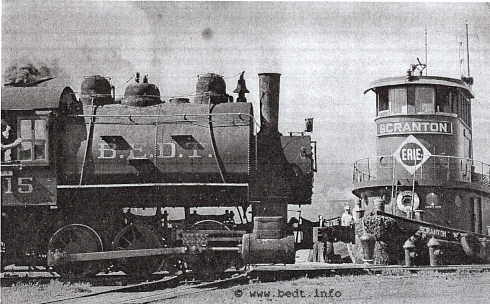 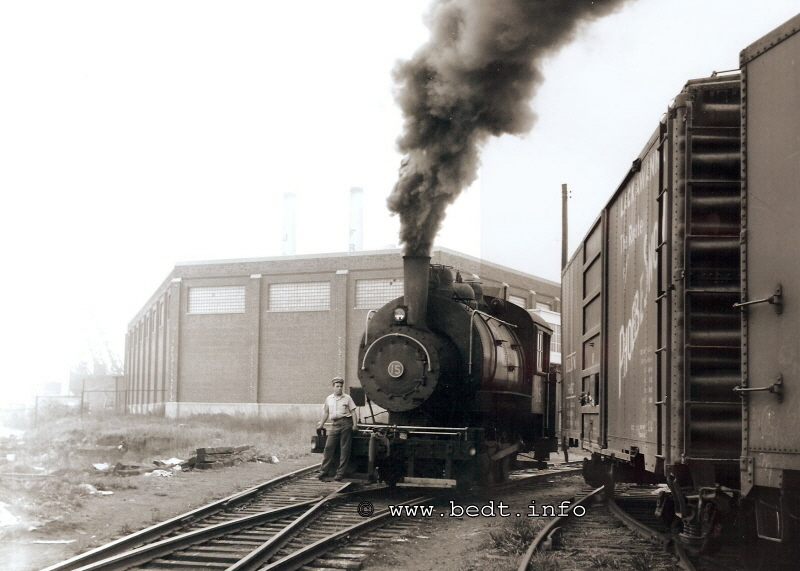 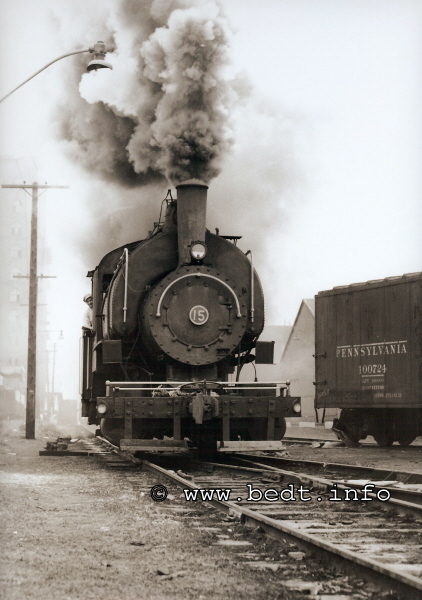 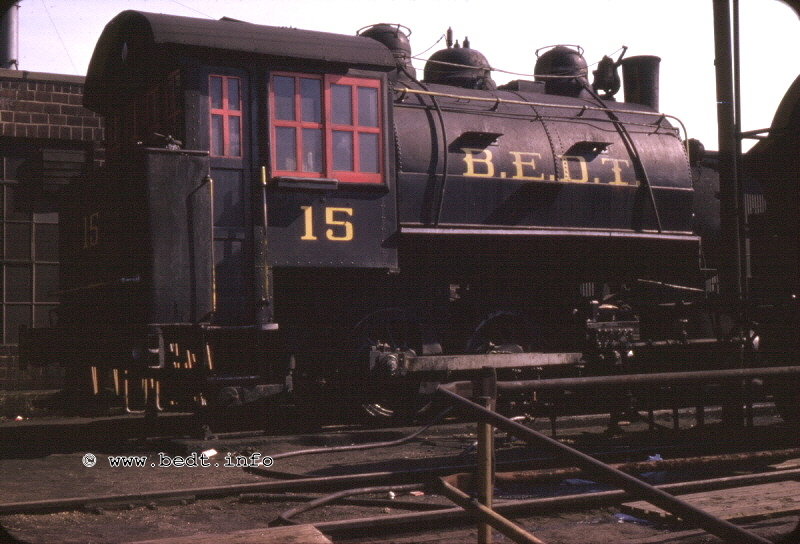 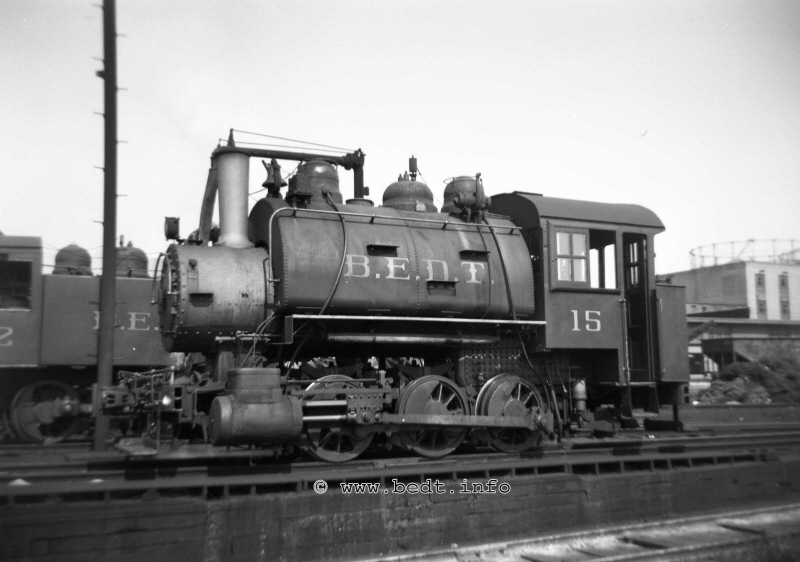 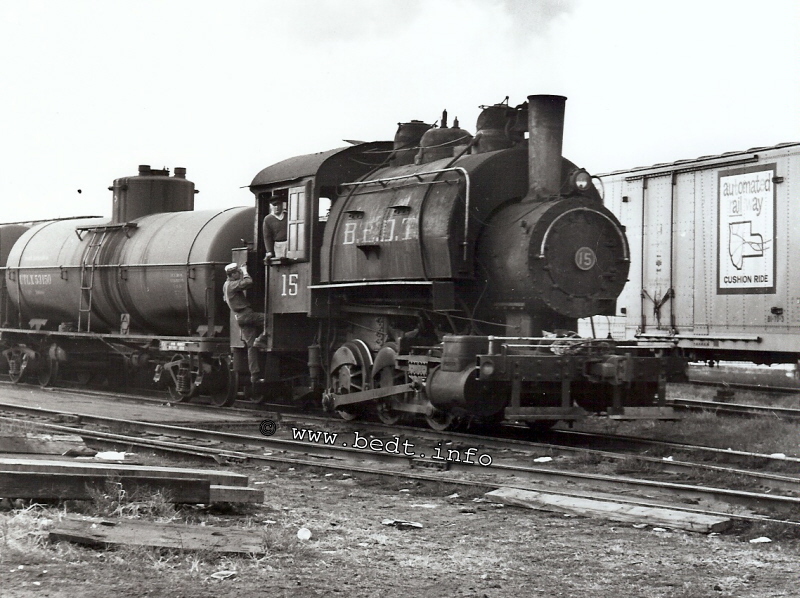 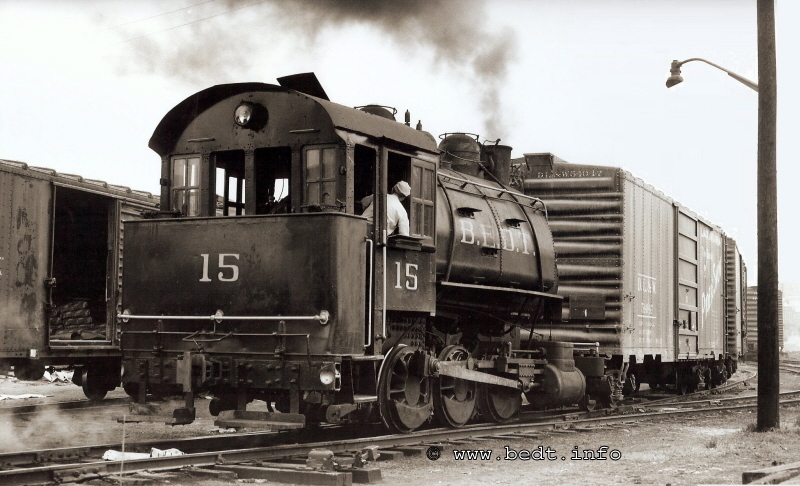 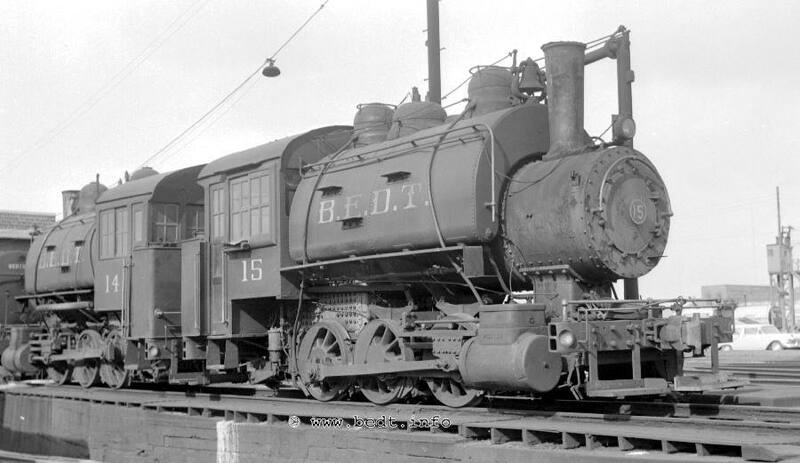 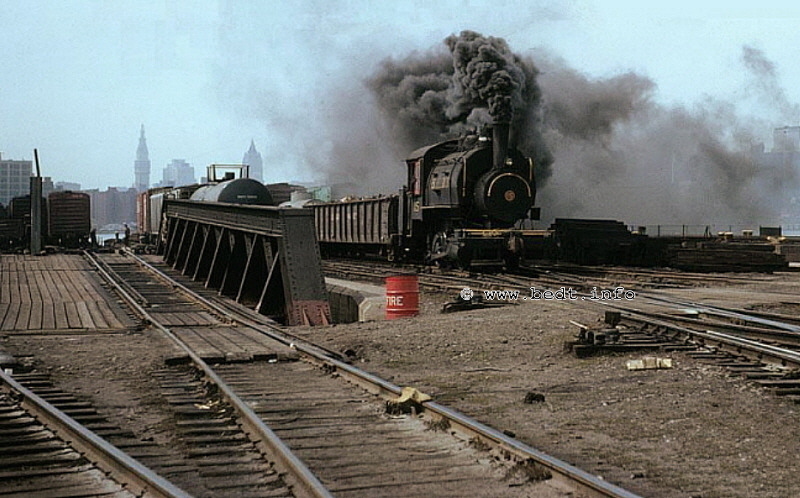 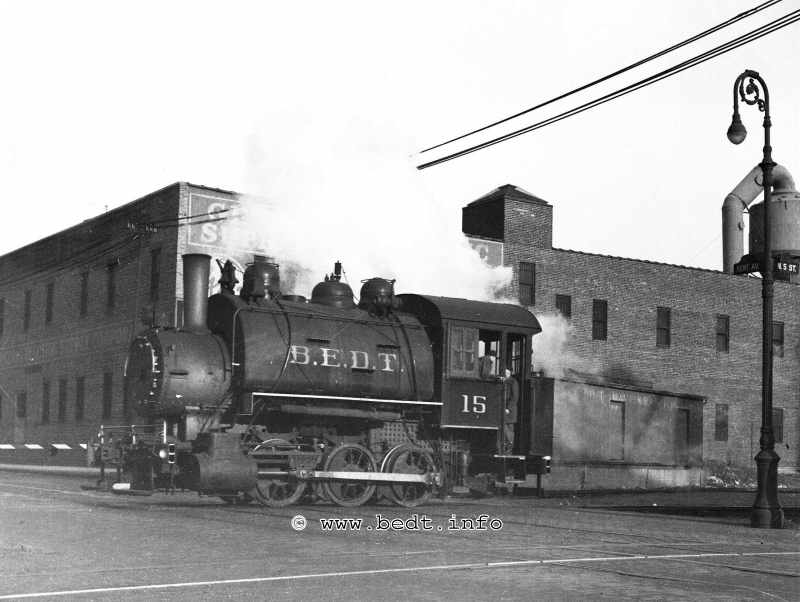 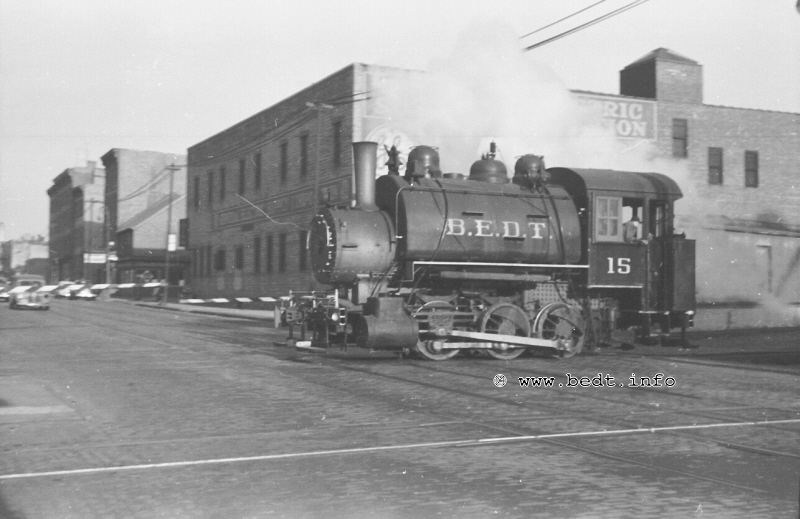 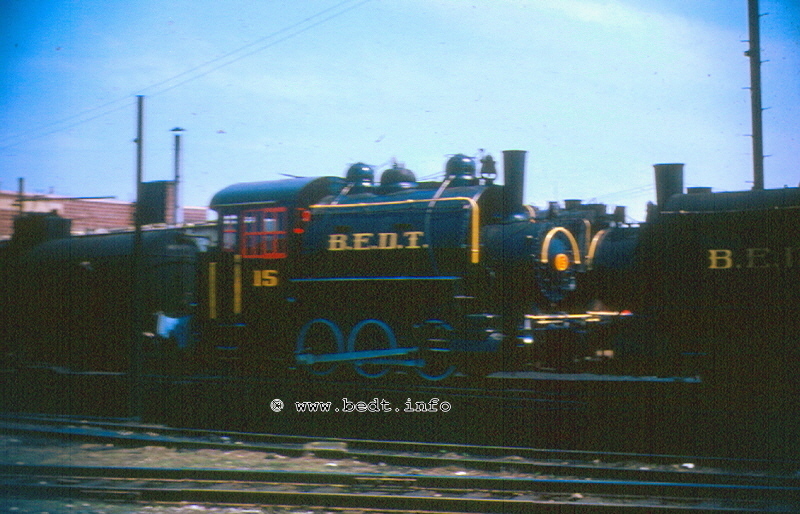 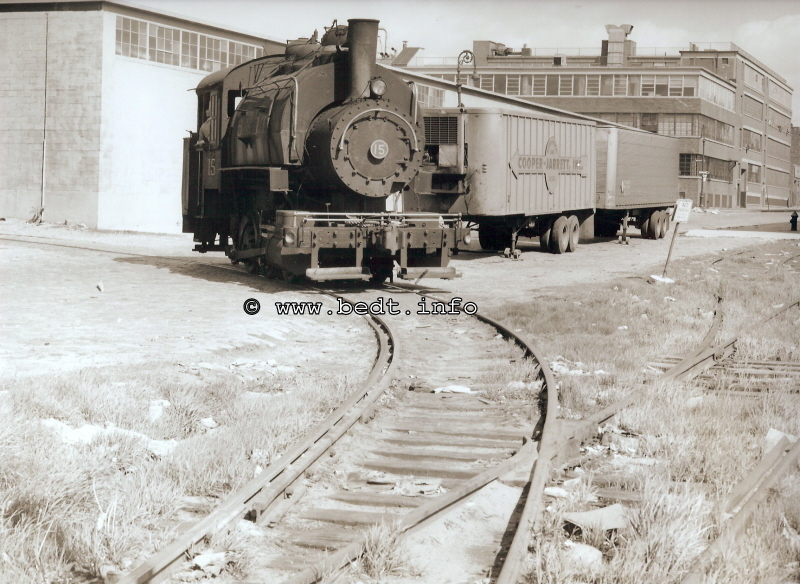 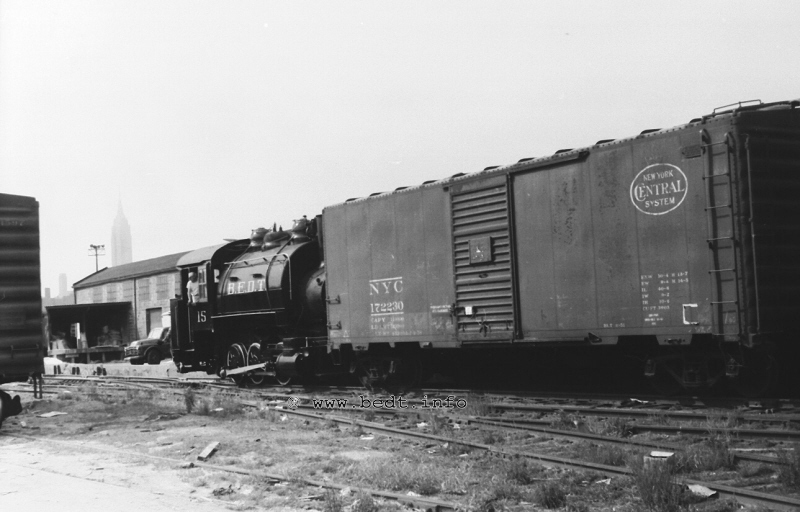 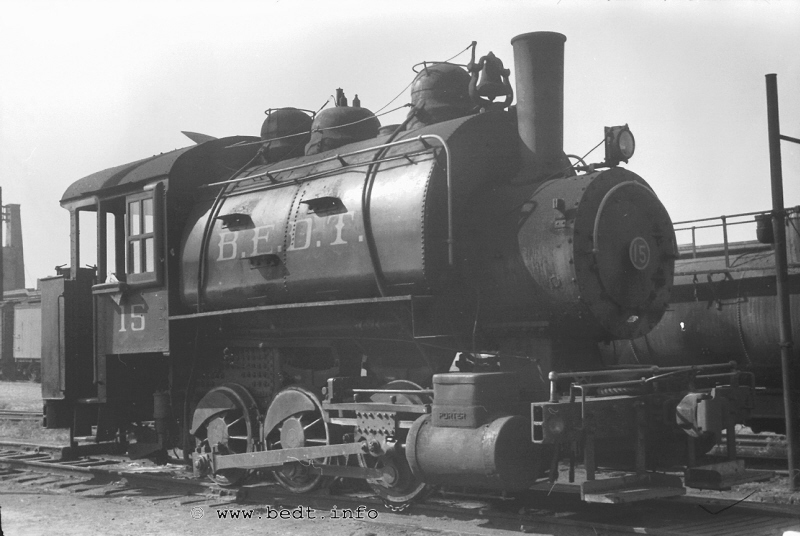 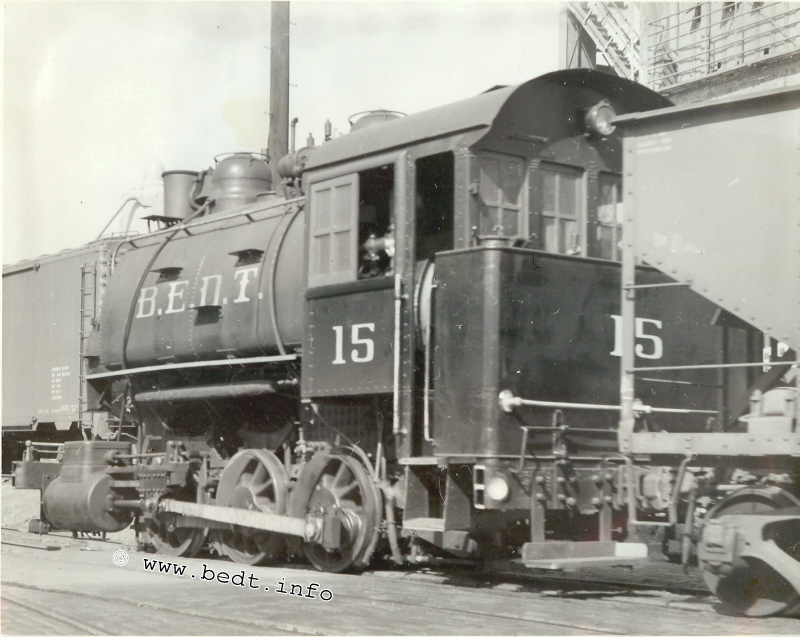 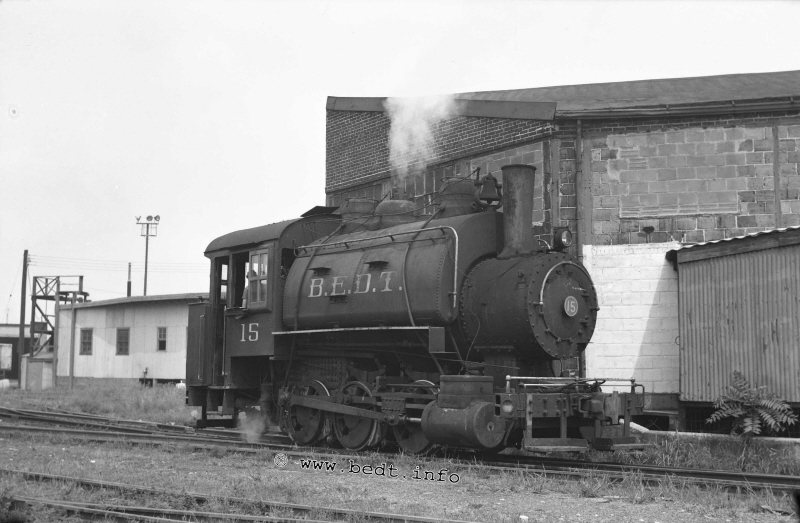 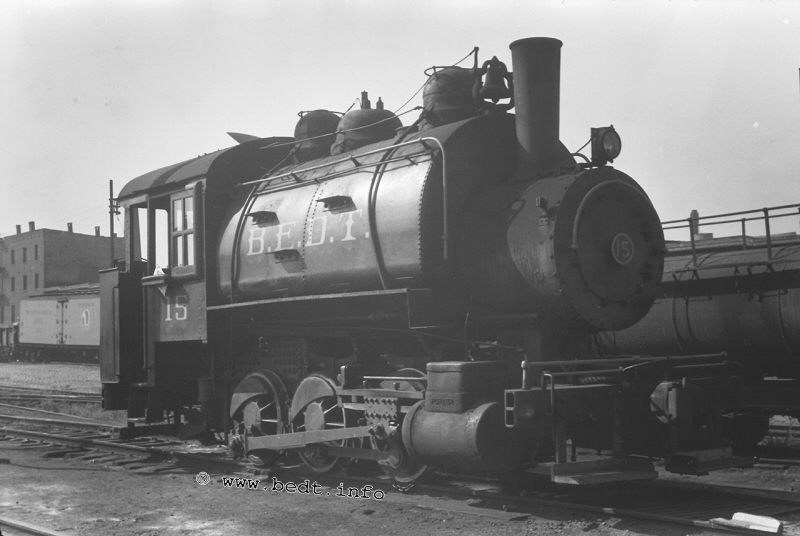 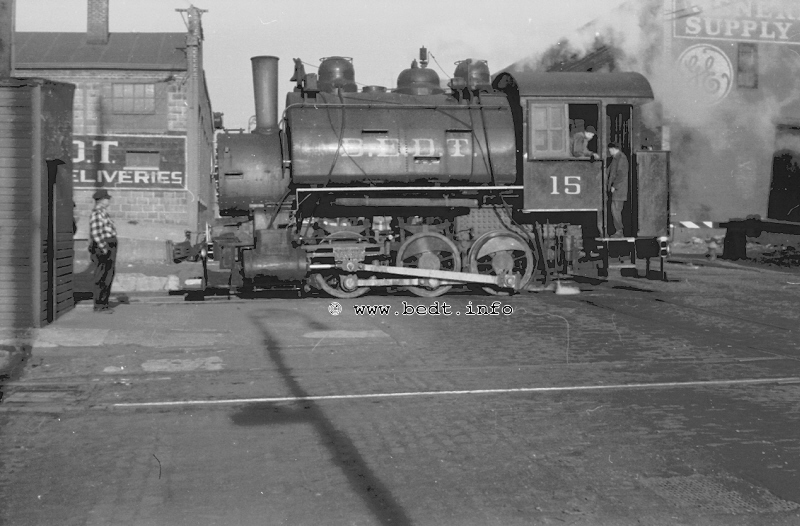 Without a doubt, one of the most historically important photographs ever taken of a BEDT locomotive! and two piece pilot foot boards. 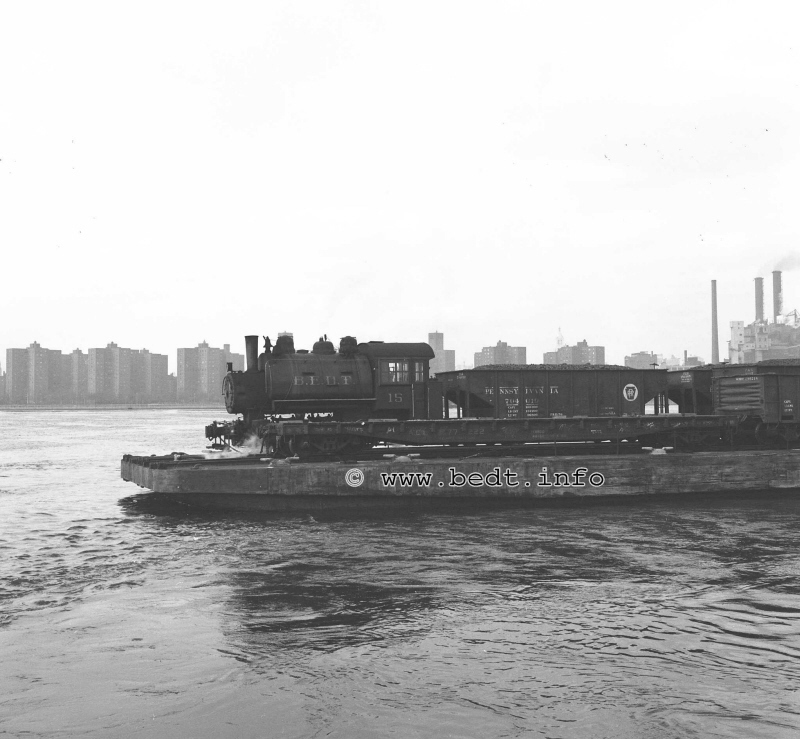 Pulling away from North 5th Street Float Bridge, enroute to Brooklyn Navy Yard. 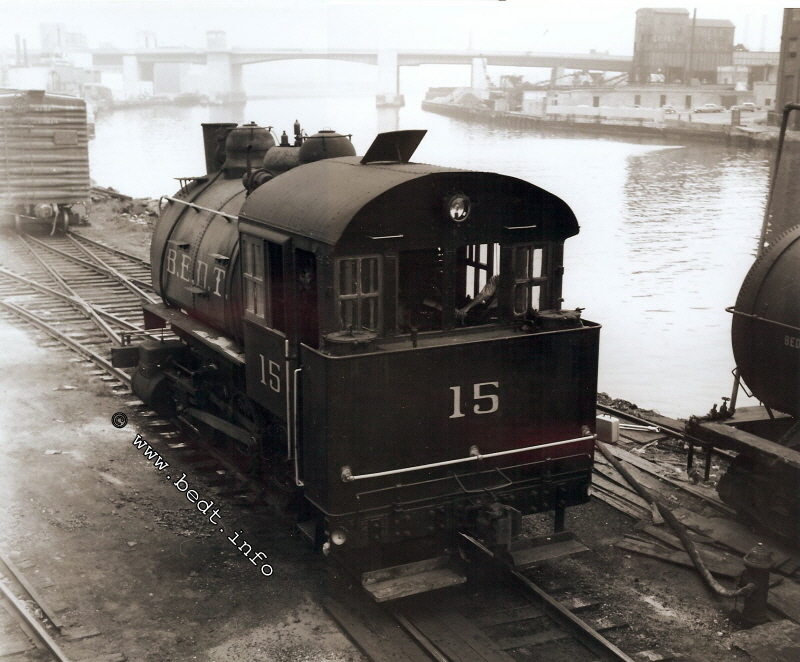 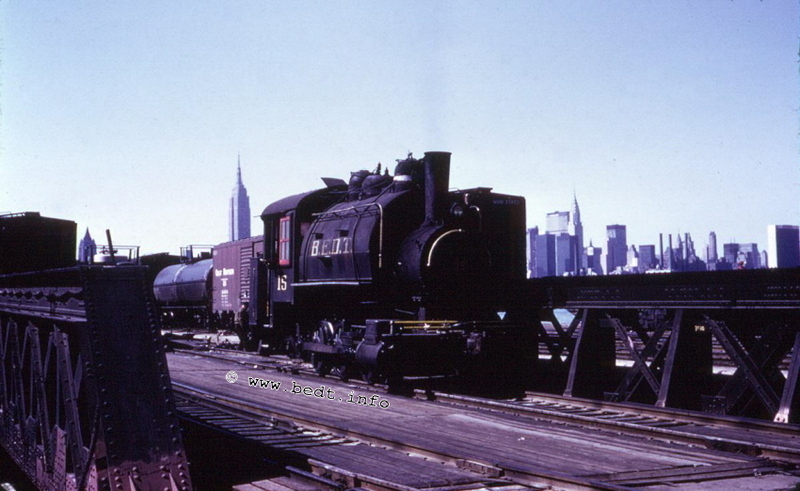 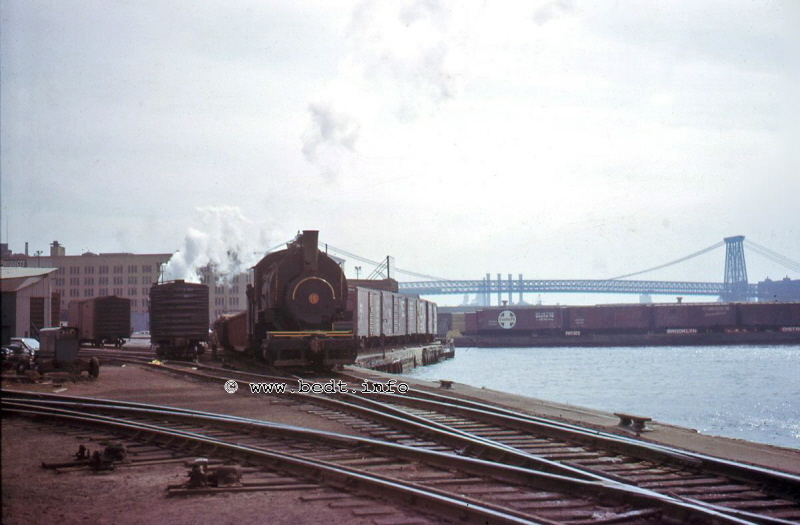 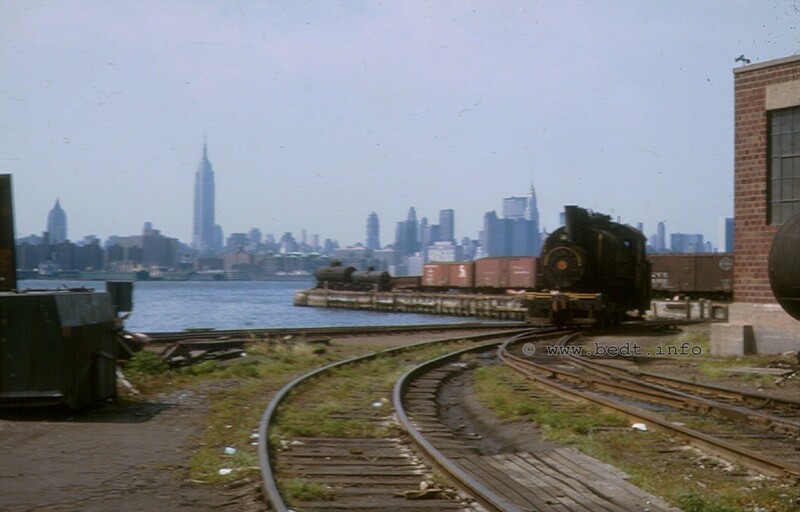 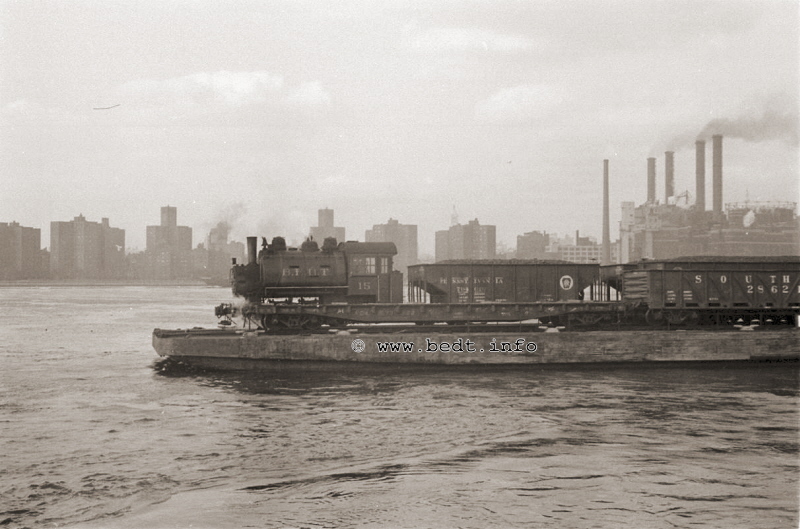 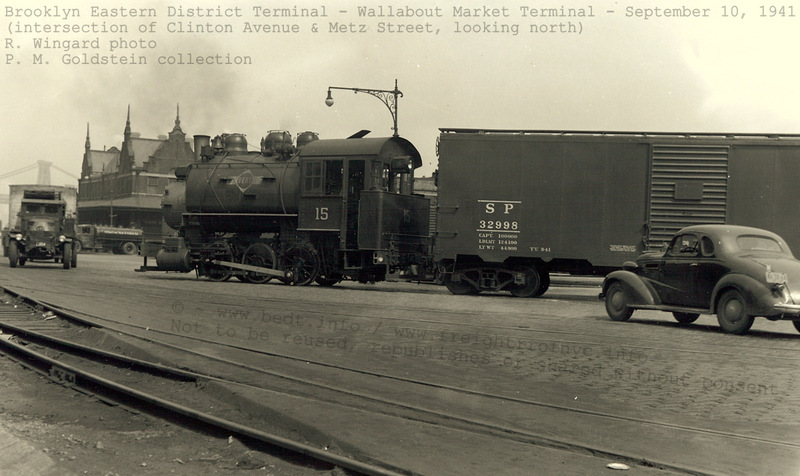 #15 aboard Carfloat #22 and enroute to Brooklyn Navy Yard (note loaded coal hoppers for BNY powerplant). 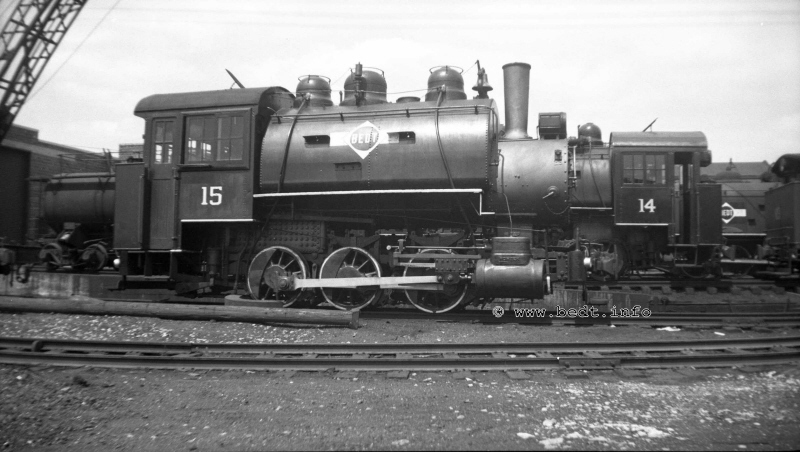 This 35mm negative was acquired off eBay in 2011.
it is the same as the preceding images (which have been on this website since 2009 and are from Dave Keller). 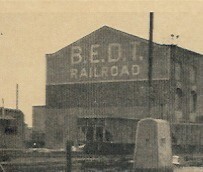 Therefore I came to a conclusion that Steve Meyers and Bradford Stiles were at this location at the same time taking photos. 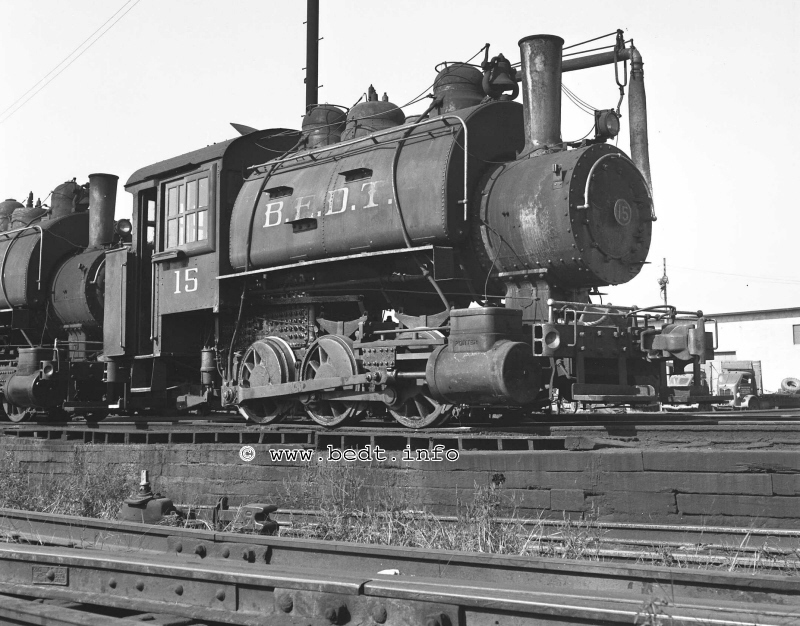 "Gosh, I haven't heard Brad's name since the first time I left New York in mid-1957. 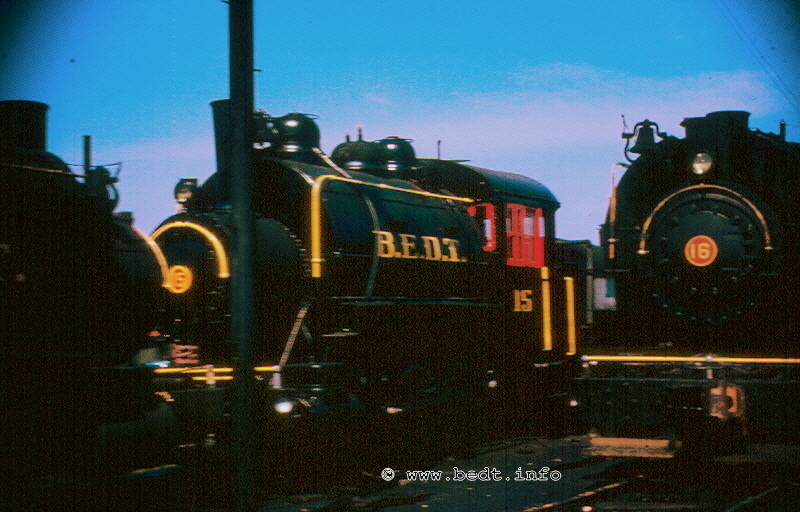 Brad and I were two thirds of a close trio of railfans who spent many years either singly, or as a duo or as a full group wandering around the metropolitan area taking (mostly) electric railway pix. 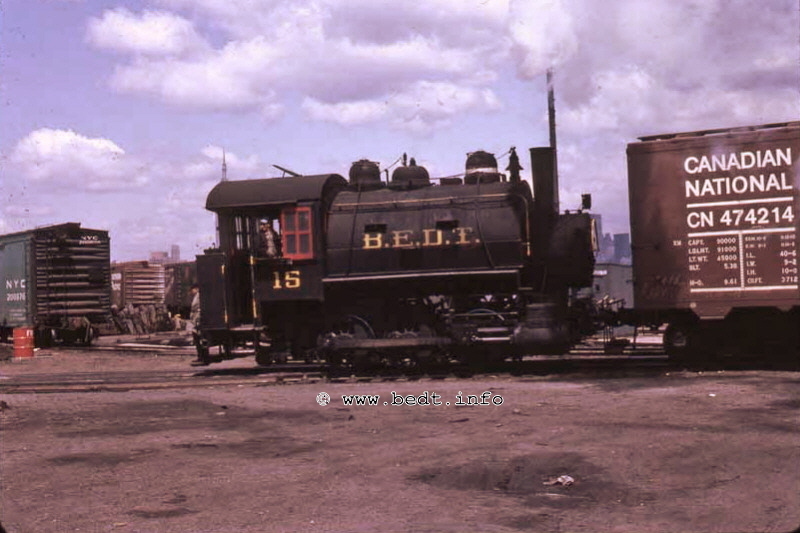 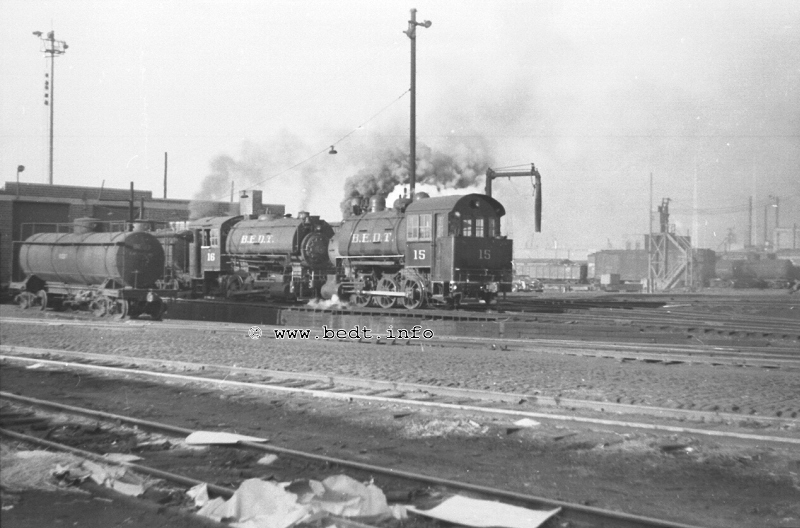 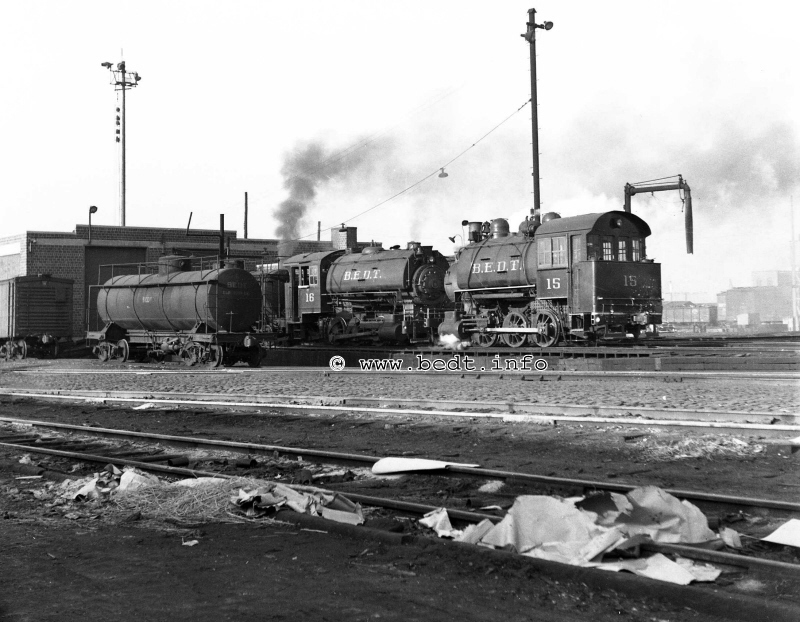 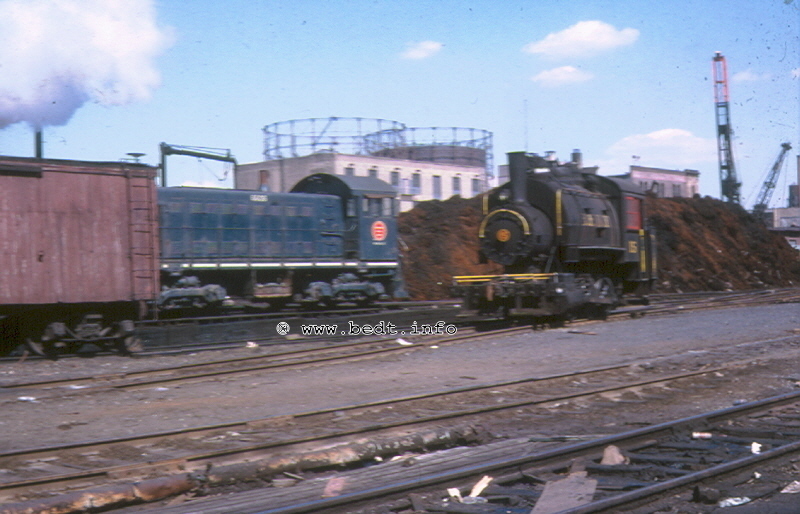 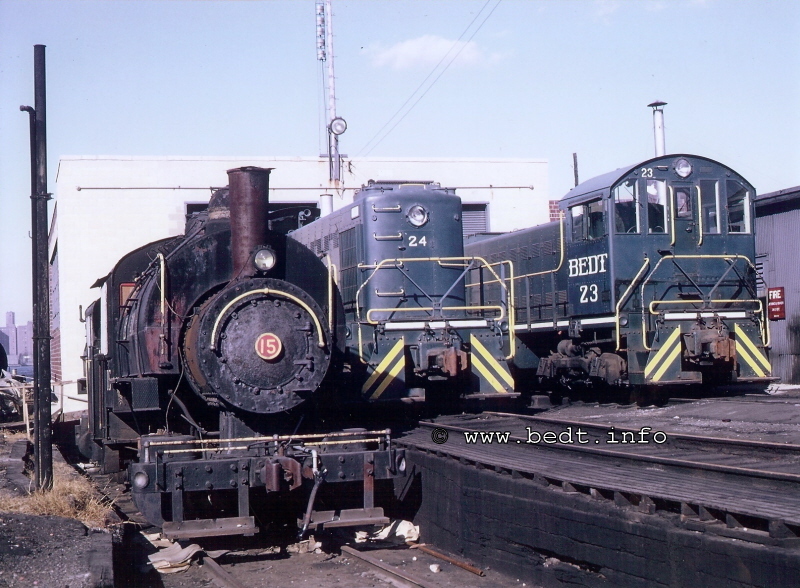 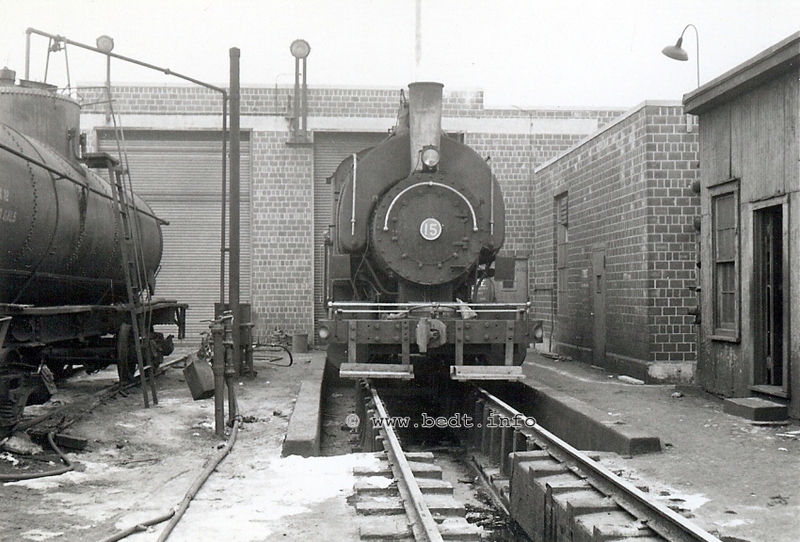 Once we heard that the BEDT was considering diesels, we spent many Saturdays around Kent Avenue before the steam operation ended.."
Note crossing shanty of right edge of photo. 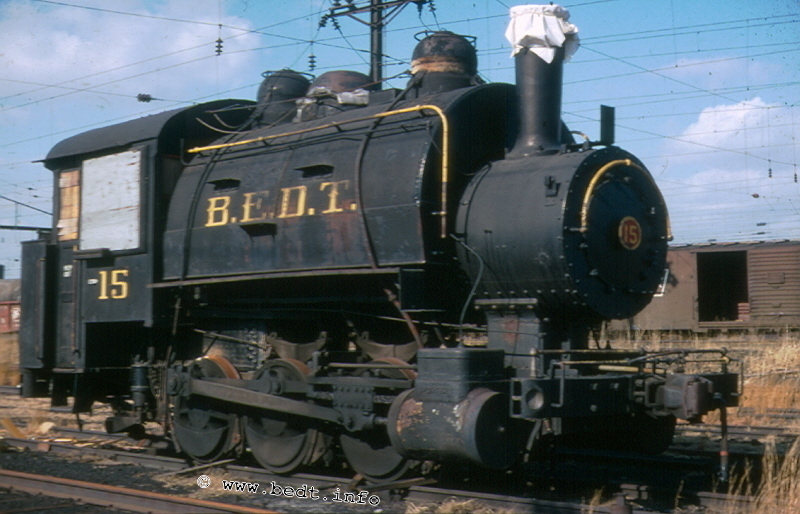 derail in front on locomotive and front driver is "chained" used as chock to prevent engine from rolling. 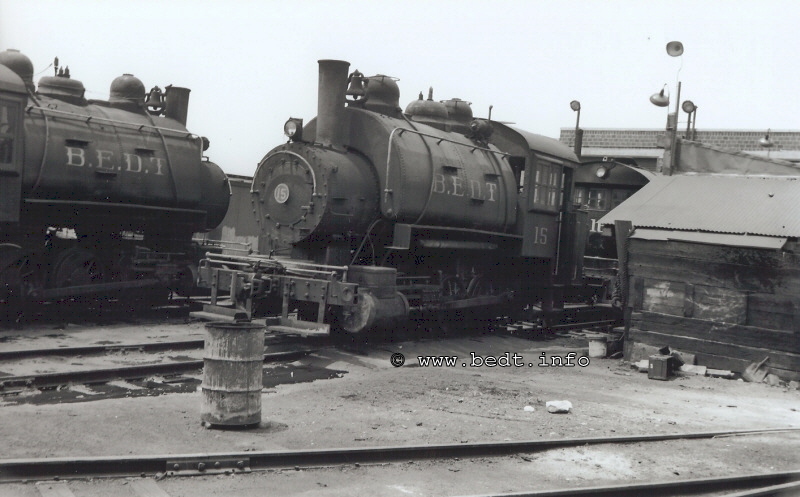 July 1957 - in front of enginehouse pit track by sandhouse. 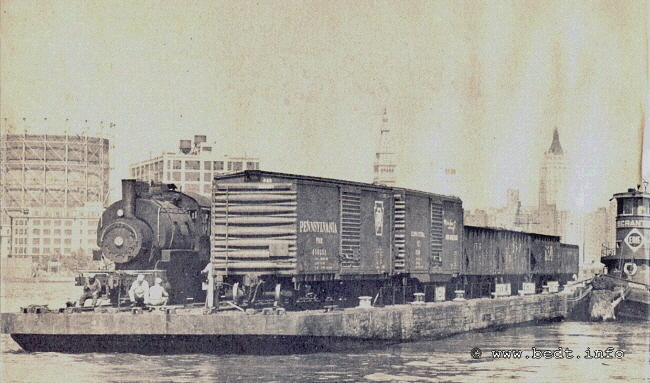 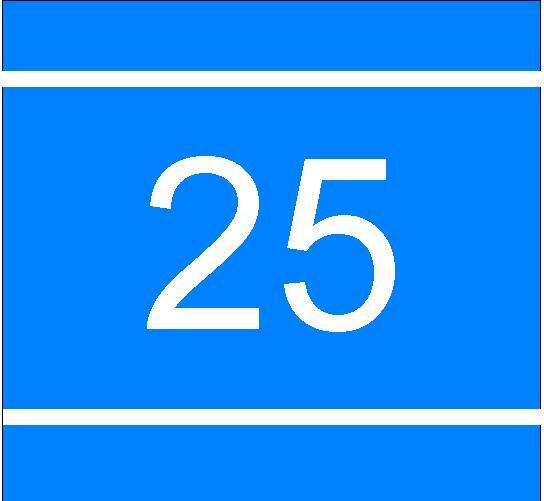 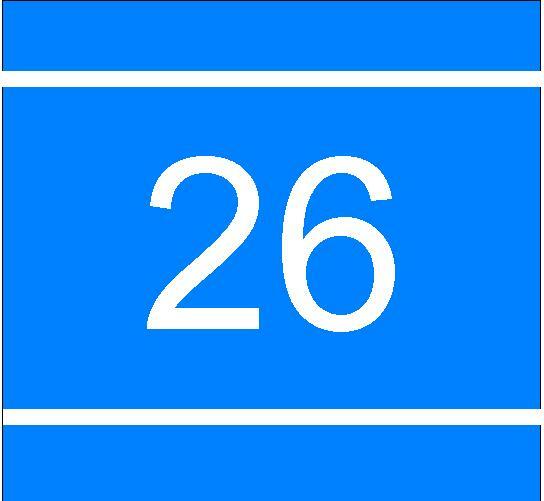 Note Carfloat 26 on right edge. 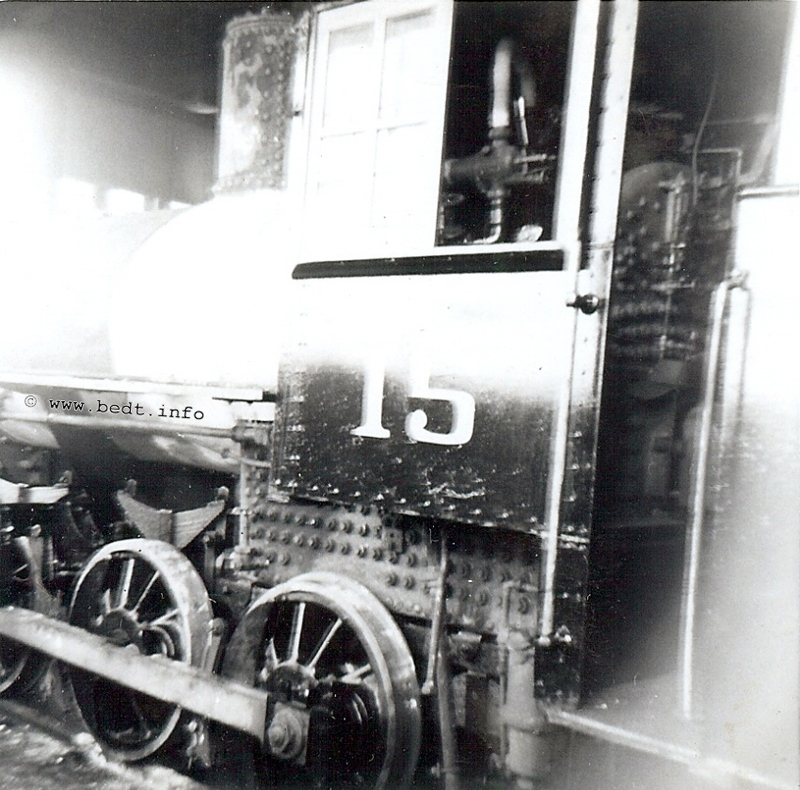 Bennie Kubicki in doorway of loco. 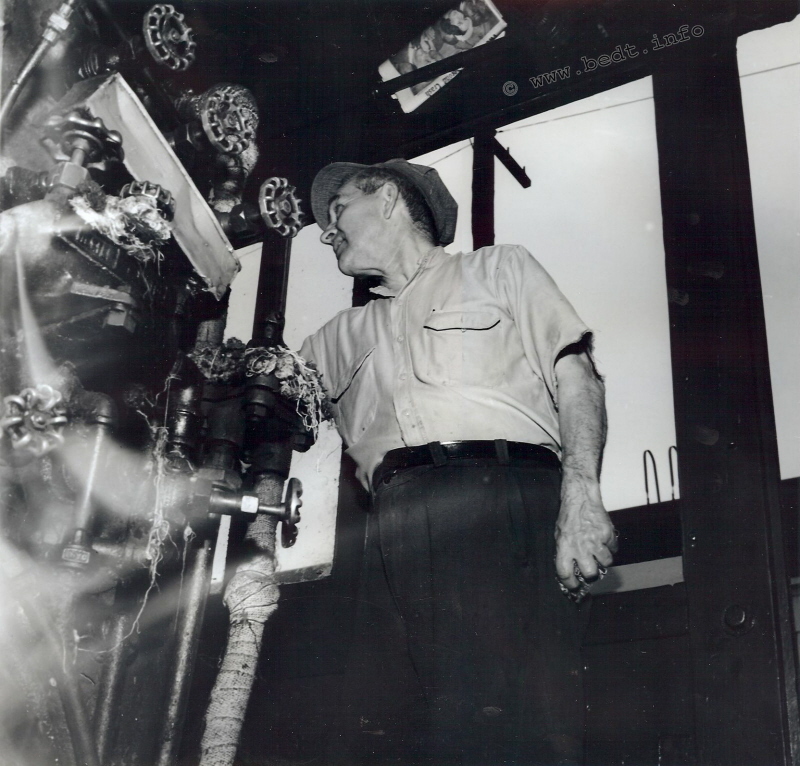 Man on firemans side footboard is Charlie Rodgers. 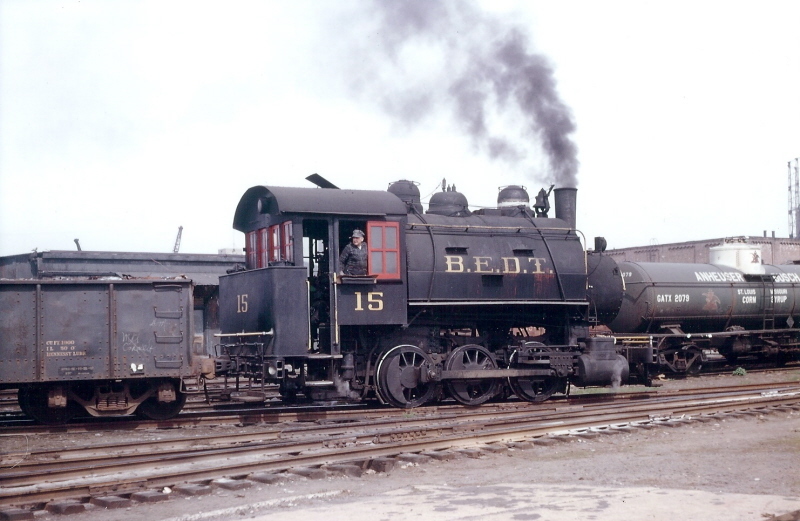 Man on engineers side footboard is Bennie Kubicki (sp?). 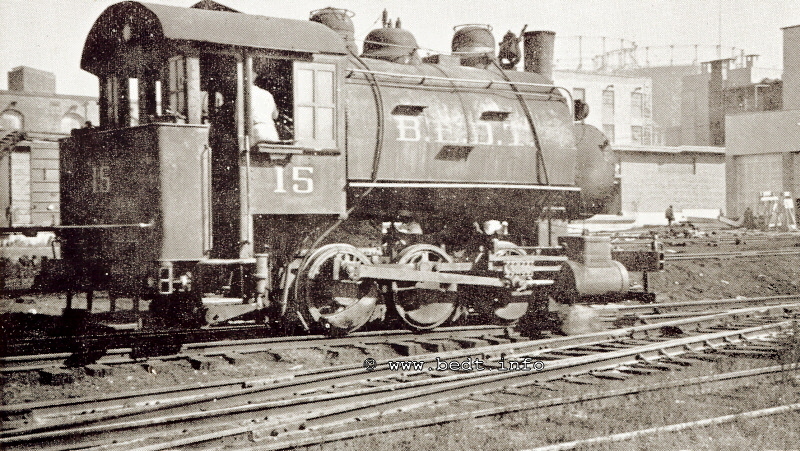 The three men in front of Invincible are track gang. 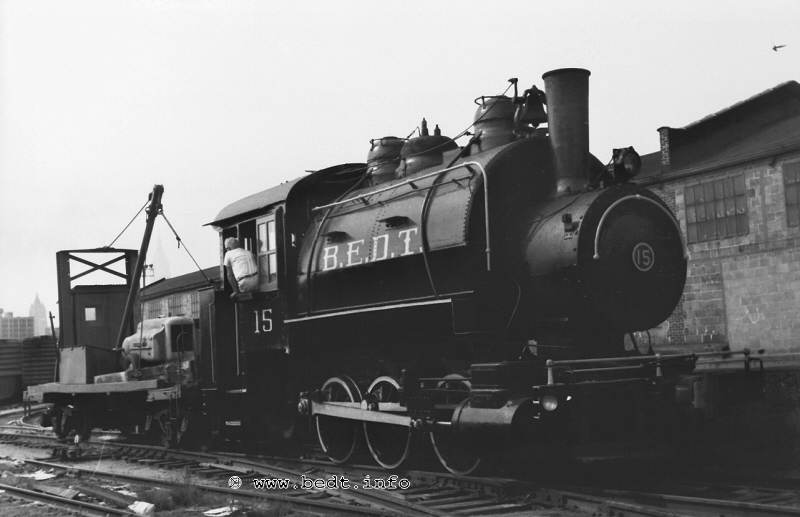 This photo negative acquired from eBay. 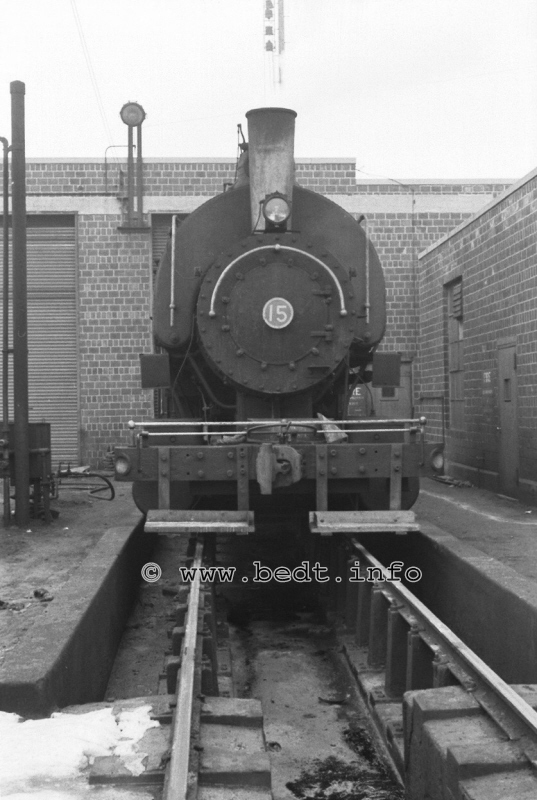 Note debris on track matches debris in next photo above! 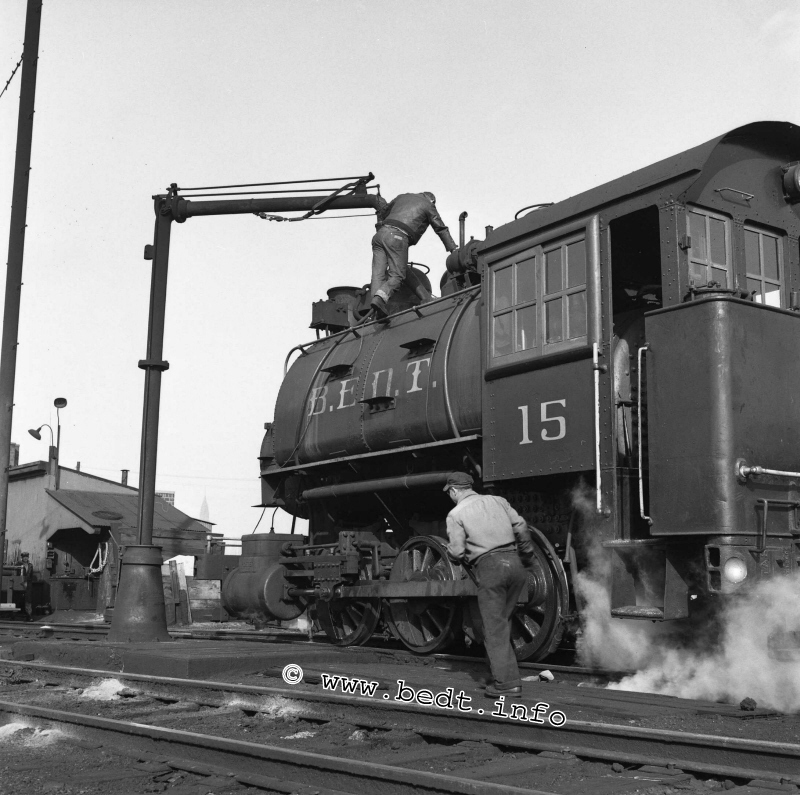 Attaching or detaching electromagnet on crawler crane. 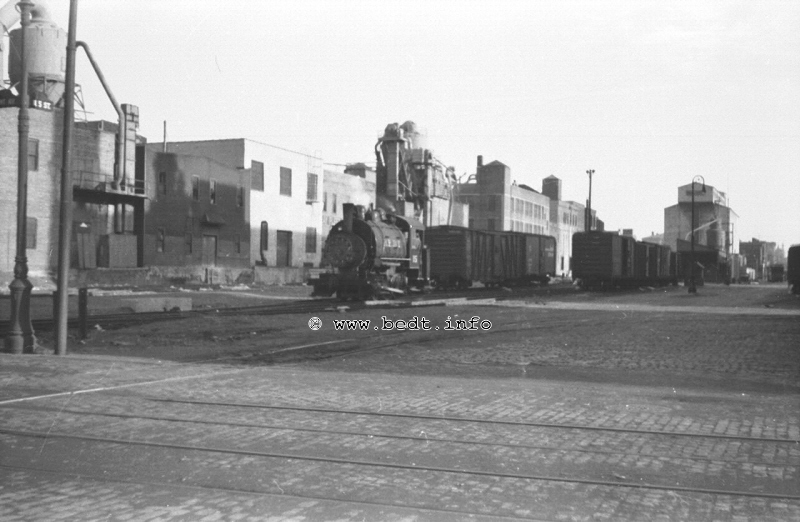 Note concrete wall with rail on top for North 8th Street Gantry. 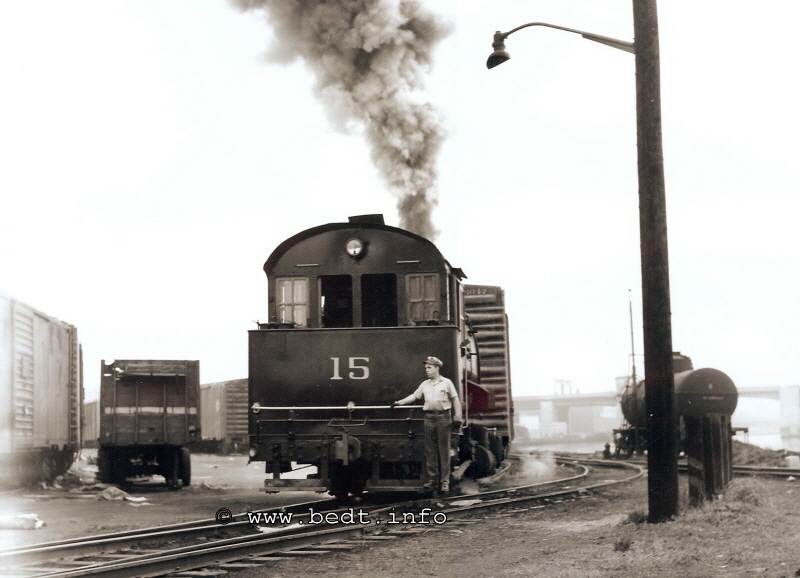 Why is the tank car leaning? 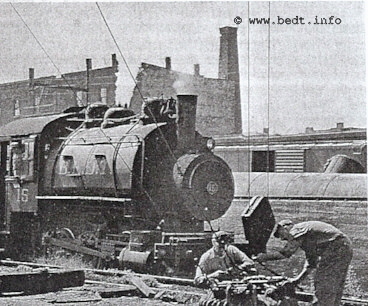 Being cut up for scrap? 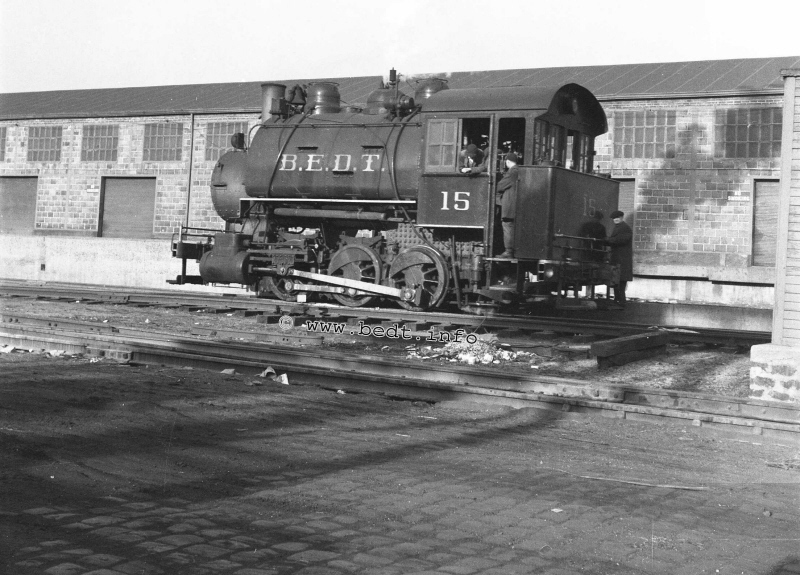 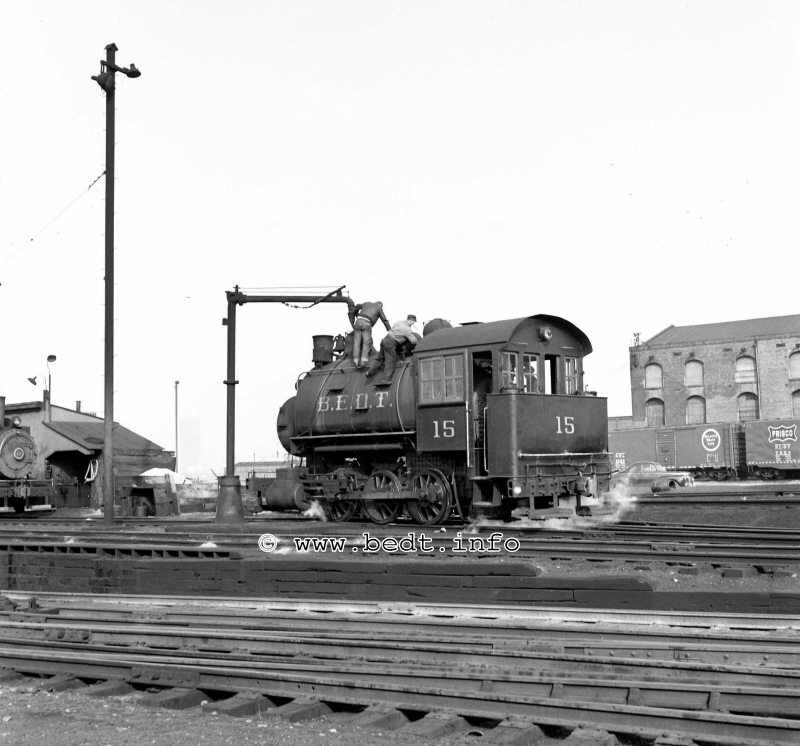 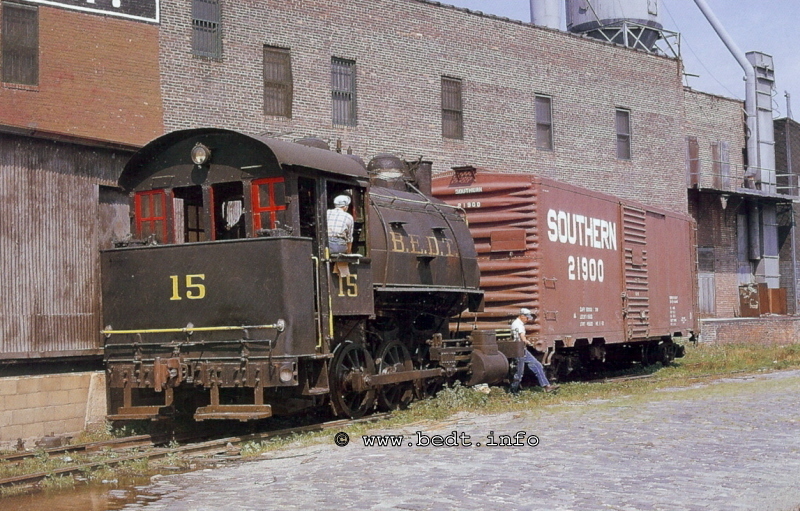 #15 on Carfloat #18 under tow by Erie "Scranton"
unknown date - at the diamond between North 8th and North 9th Streets behind the enginehouse. 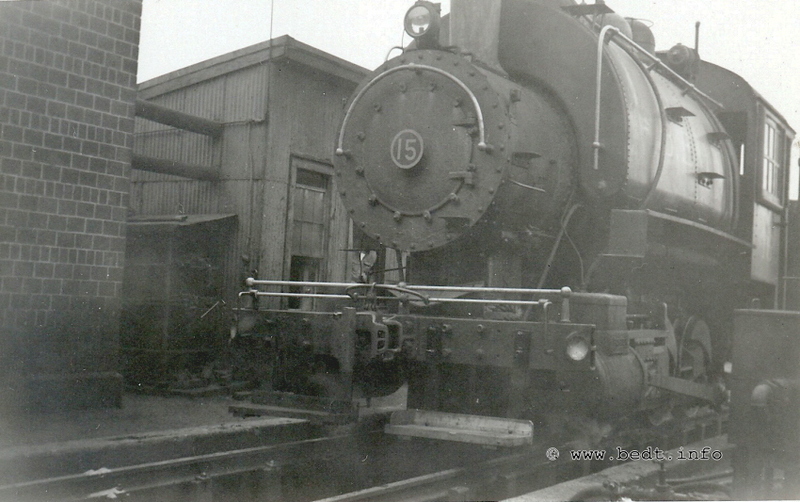 unknown date - #15 working 8 Pier and #16 working 9 Pier. 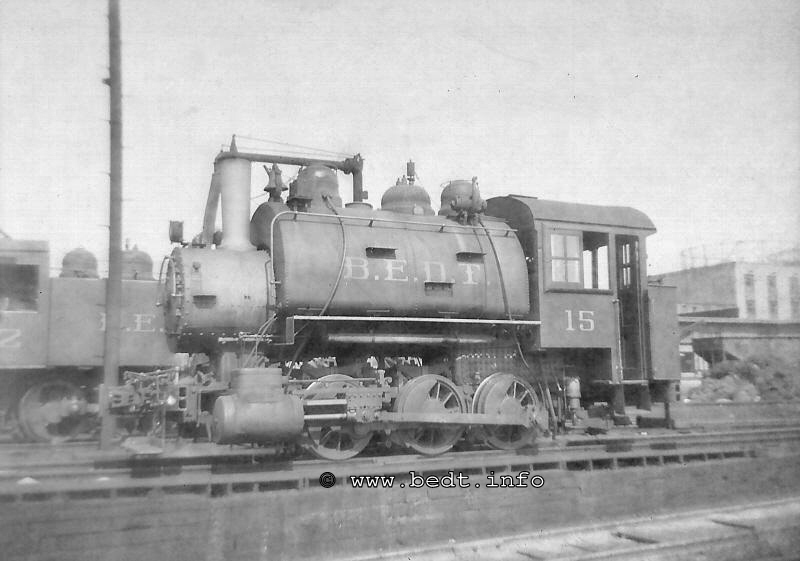 #15 would be shopped, and the square bottoms on the saddletank were welded on. 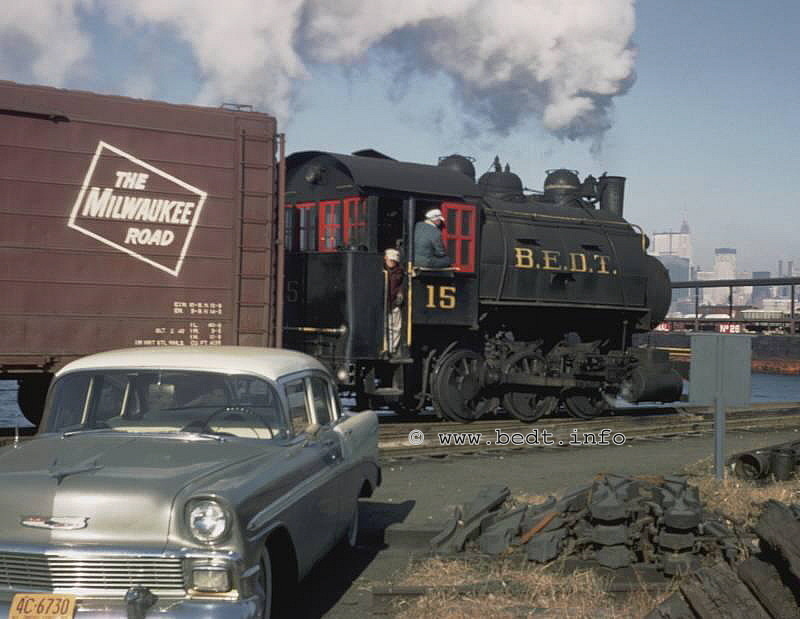 note Derrick Car X11 being towed! 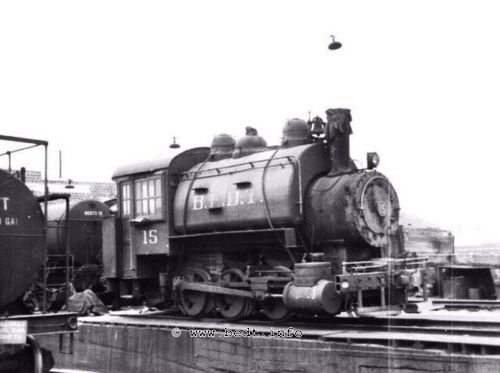 therefore believed to have been taken same day. 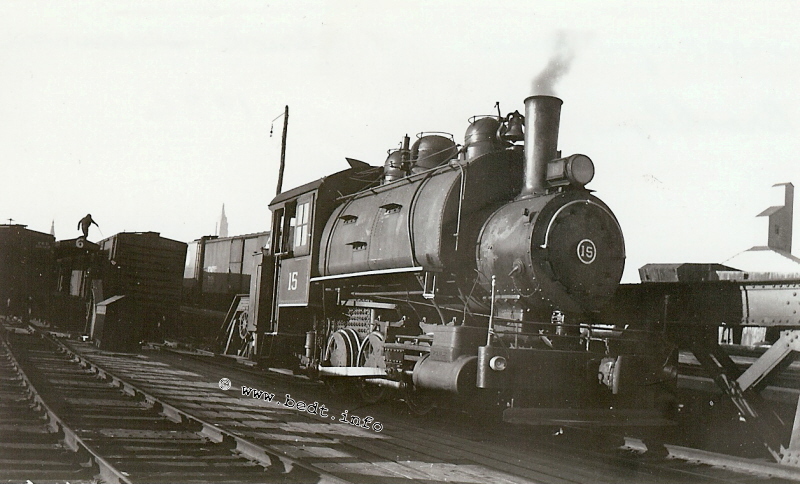 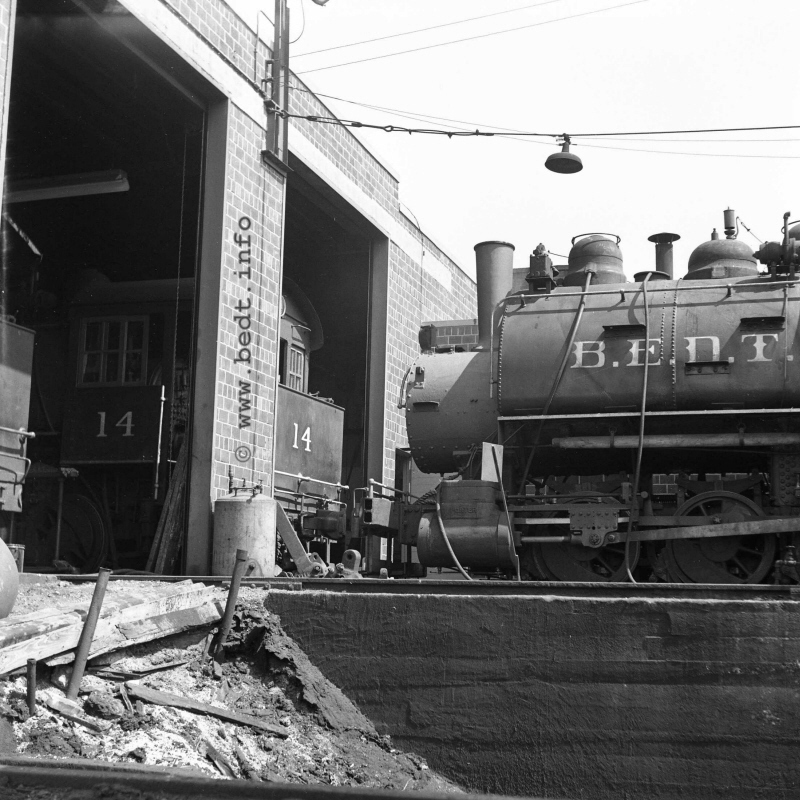 Frank Hendrickson at front of locomotive. 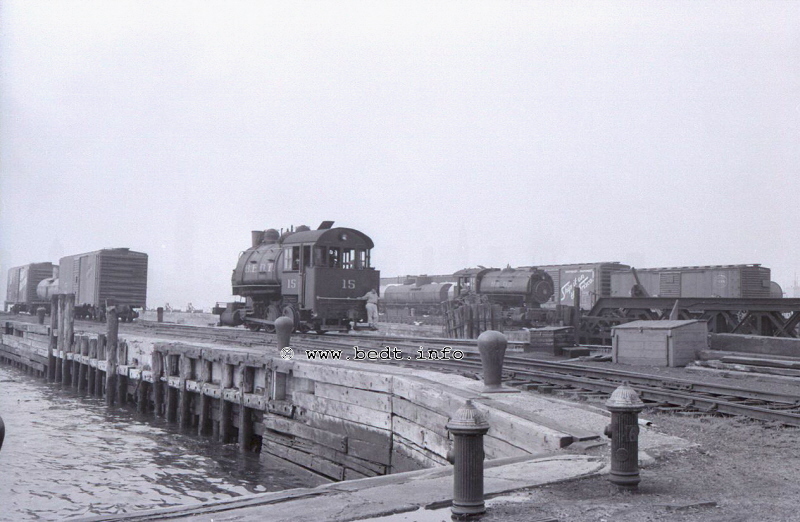 Note Bulk Flour Terminal under construction! 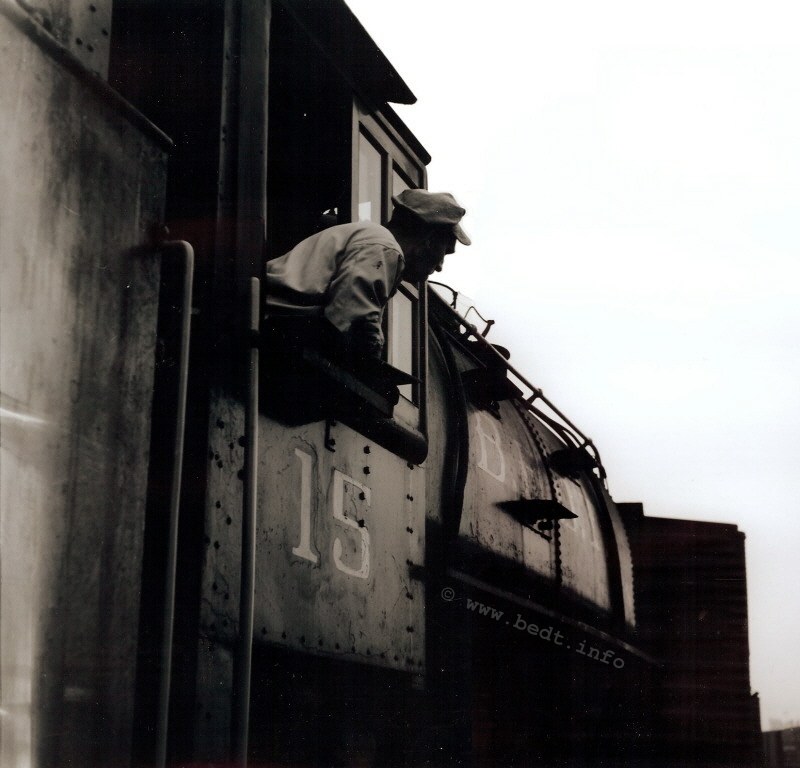 Tom Conroy engineer, Frank Hendrickson on cab ladder. 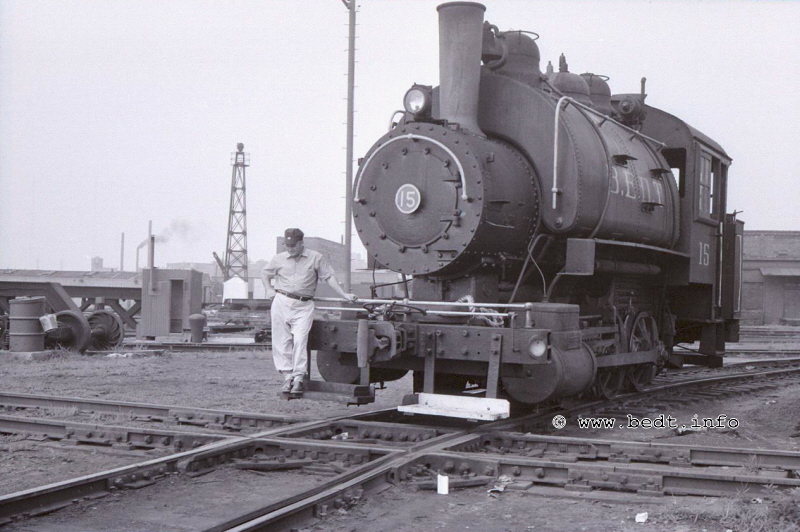 unknown engineer, Harry Lynch on footboard, Willie McNeil with lantern?. 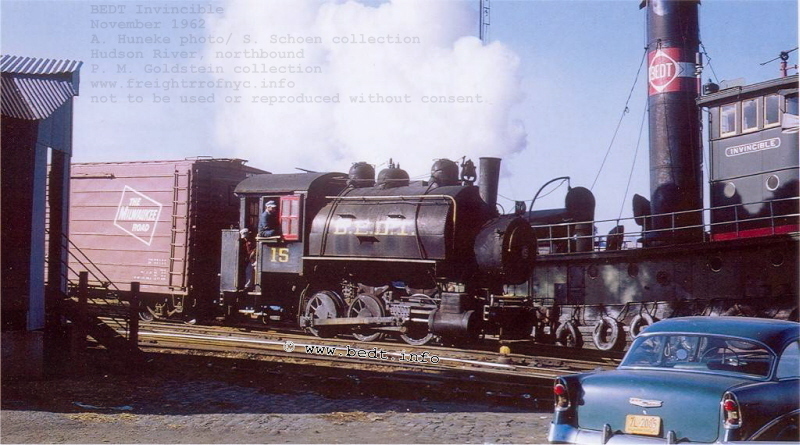 Gene related an interesting story to me when I purchased this photo. 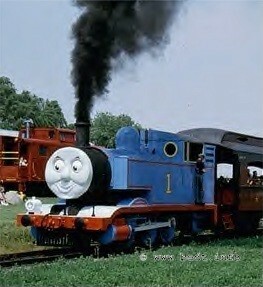 Just before he took this photo, he asked the engineer to "smoke it up" and the the engineer complied. 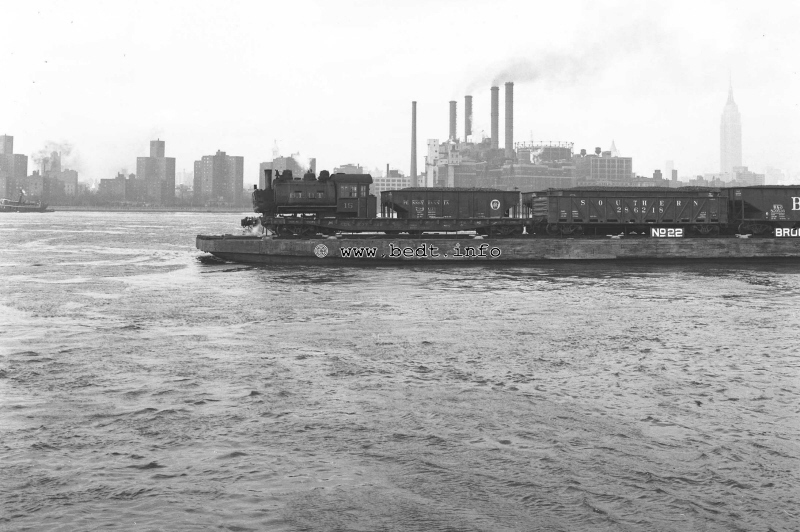 from Manhattan and saw his way to Brooklyn to chastise the engineer!